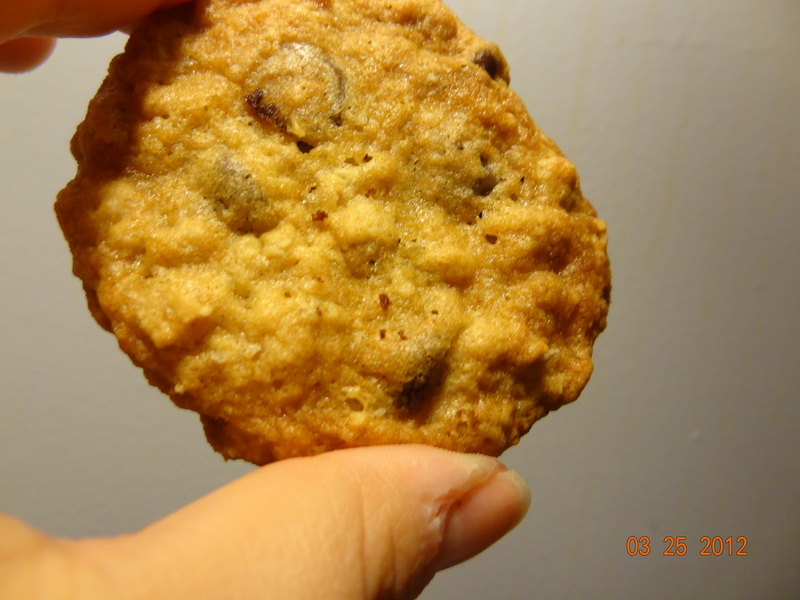 I ate the most delicious Oatmeal Chocolate Chip cookie on Friday (turns out it’s 14 points a piece- never again!) that I was inspired to make some at home this week and enjoy as my mid-afternoon snack for my weekday meals. 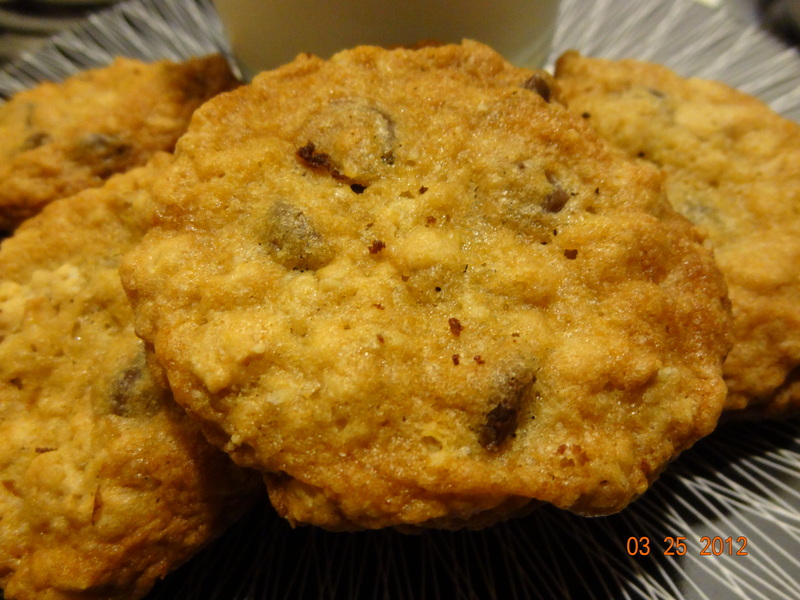 This recipe is really easy, and even my boyfriend who is super picky with desserts enjoyed these cookies. 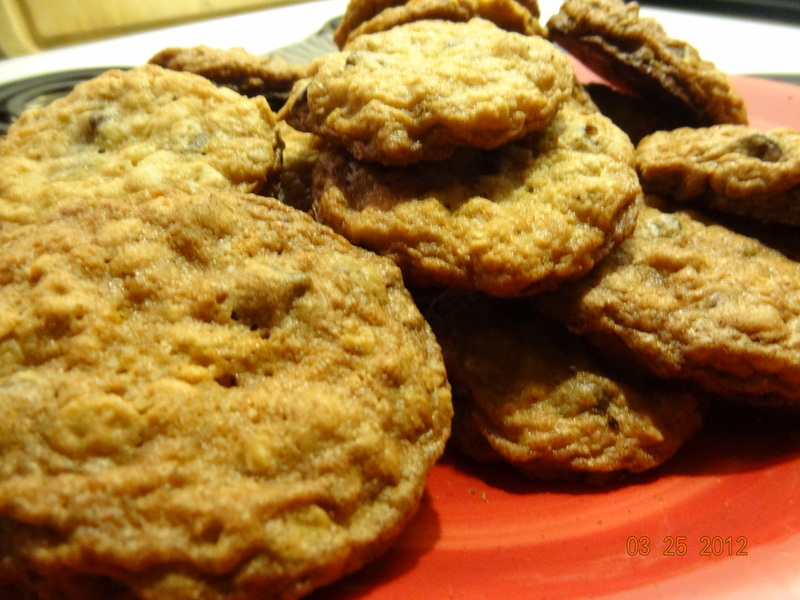 Something about the chocolate with the oatmeal with the brown sugar makes these cookies addictive! They are the not the healthiest recipe I could have make this week, but at only 4 points a piece, you can enjoy one with a cup of skim milk and not ruin the rest of your day. Ahhh. My egg rolled out of the image. Sorry about that! 2. 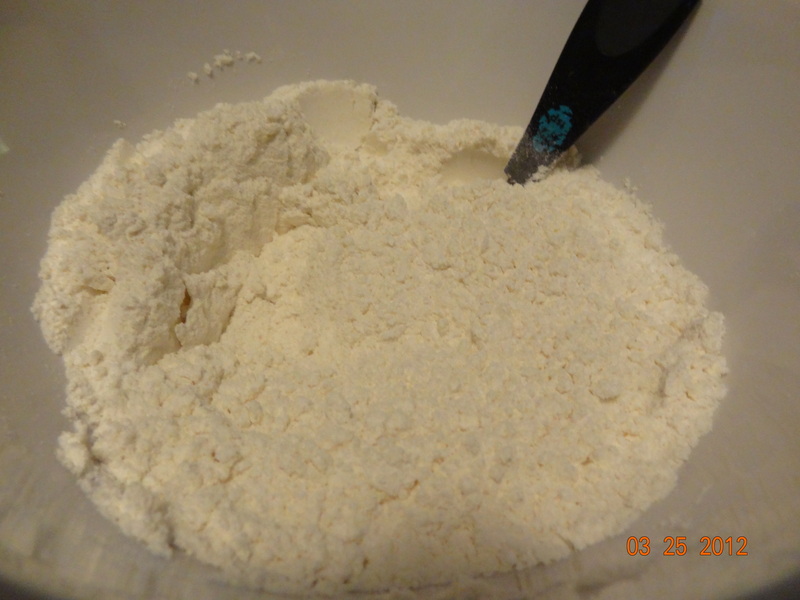 Sift together the flour, baking soda, baking powder, and salt in a medium bowl. Set aside. 3. 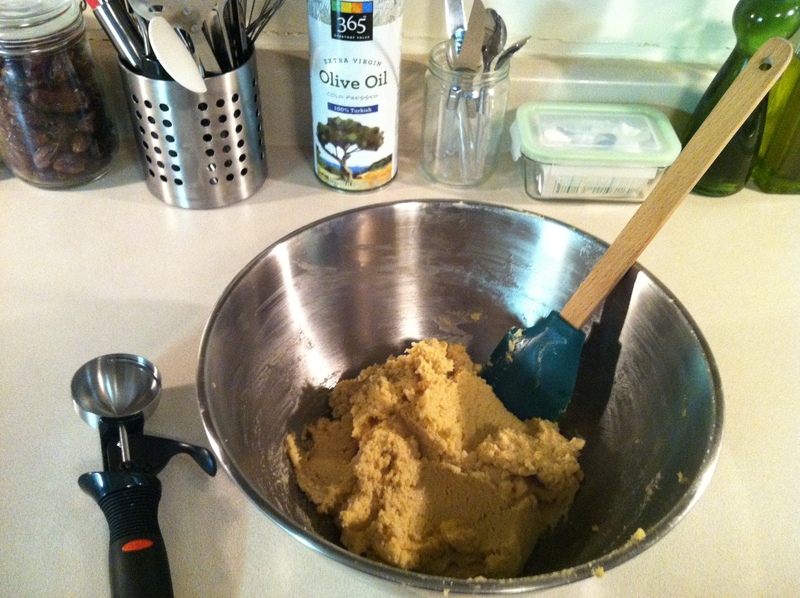 Using a mixer, cream the sugars with the softened butter for about two minutes. Add in the egg, vanilla, and milk. Mix until smooth. 4. Slowly add the dry ingredients into the wet ingredients, with the mixer on low. 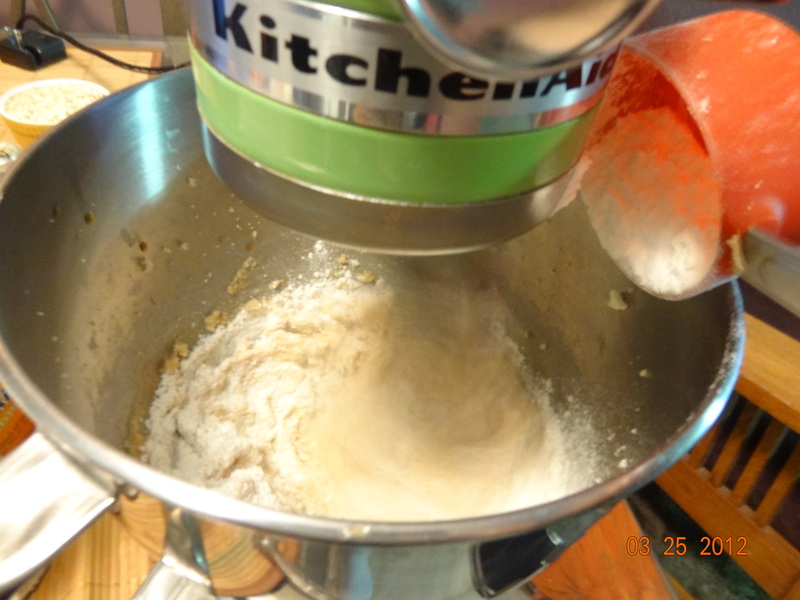 Mix just until flour disappears. Don’t over mix. 5. Stir in the oats and chocolate chips by hand. 6. 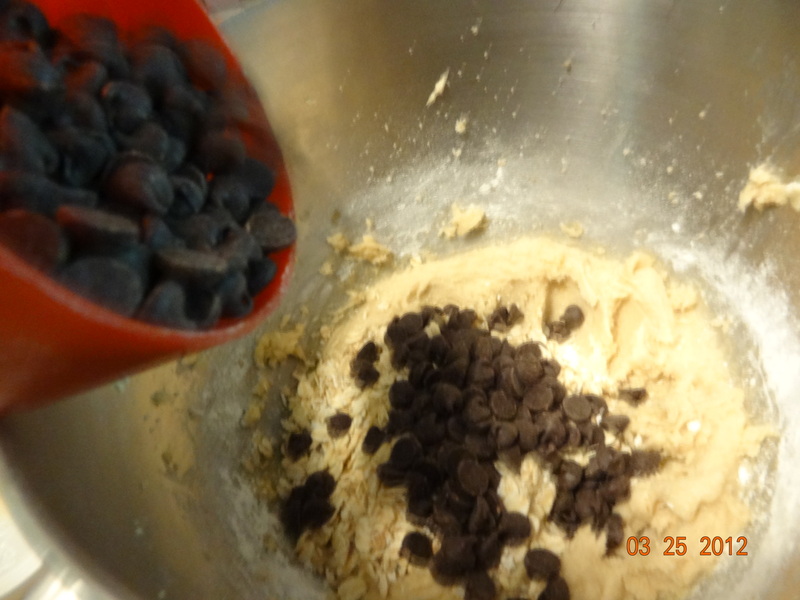 Form rounded cookie dough balls, using about 1 T of dough. Place dough balls on a cookie sheet lined with parchment paper or a Silpat or on a non-stick. 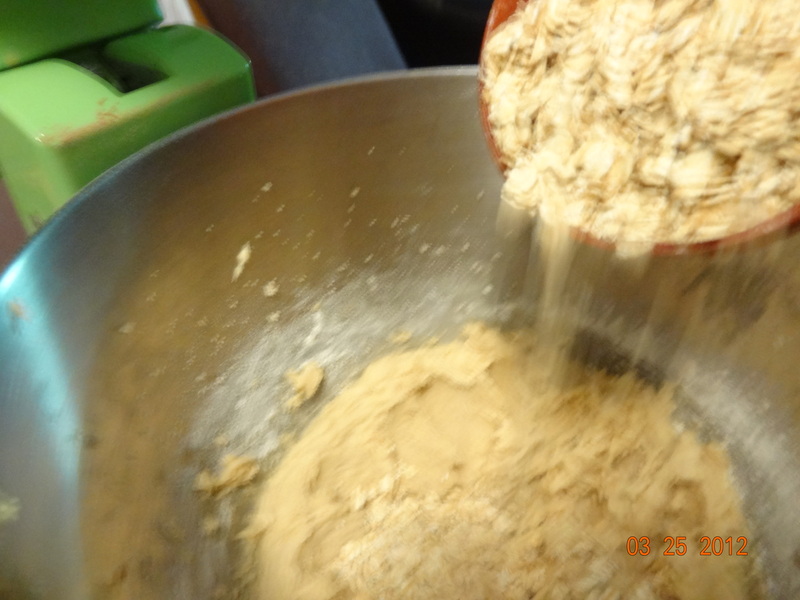 Your dough will be chunky, like this (see below). 7. Bake cookies on 2nd to upper rack for 11-12 minutes or until lightly golden around the edges. Let cookies sit on the cookie sheet for a couple of minutes to set up. Then move to a cooking rack. Makes approx. around 2 dozen cookies (I got 27, or was it 29?). 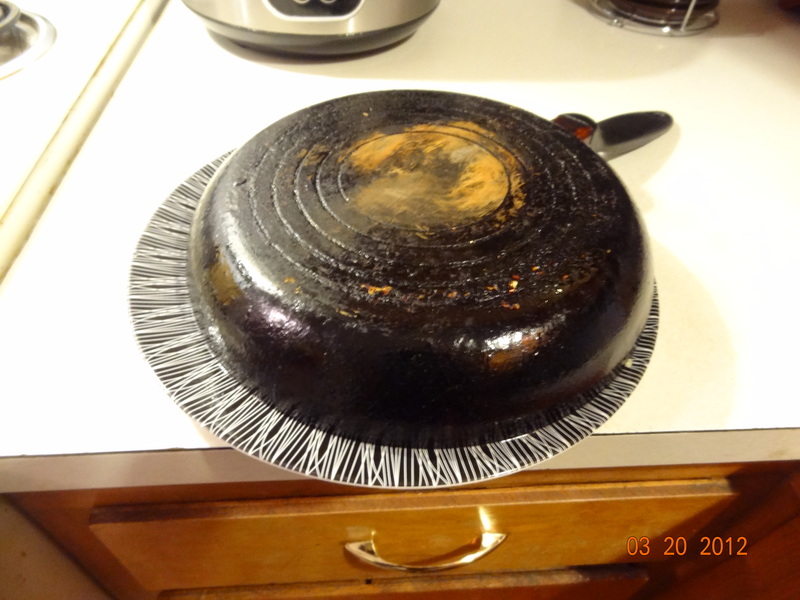 Check out my dated cookie pan. I need a new one. But hey, it’s well-seasoned! I was perusing my recipe binders this week when I came across this recipe I printed years and years ago and have never tried. It is probably from a cooking light recipe way back in the day that I actually used to type up from the magazine. Apparently I had time on my hands. Lentils are one of my favorite legumes and there is this one place in New York City that every time I go I get their warm lentil salad. It is amazing and next time i’m in town i’m going to write the flavors down instantly so I can try to re-create it at home. Until that day, I bring you this bit of deliciousness. 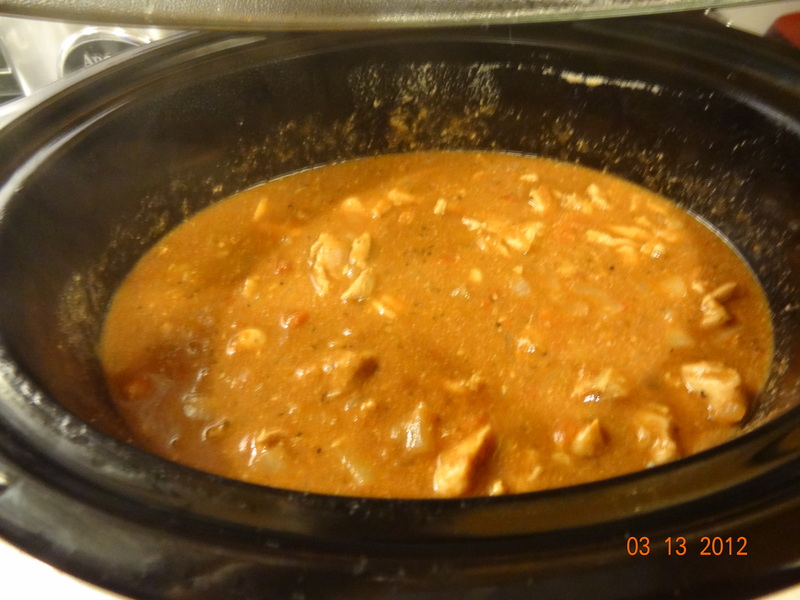 I used a crock pot since that is my favorite kitchen appliance these days. However, the recipe does call for stove top and probably it would be a pretty quick dish. Maybe an hour start to finish. 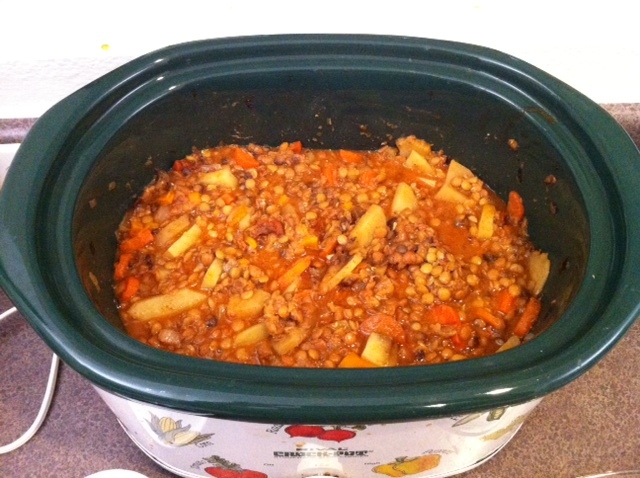 It also makes a TON of food, so feel free to reduce the amount of lentils. 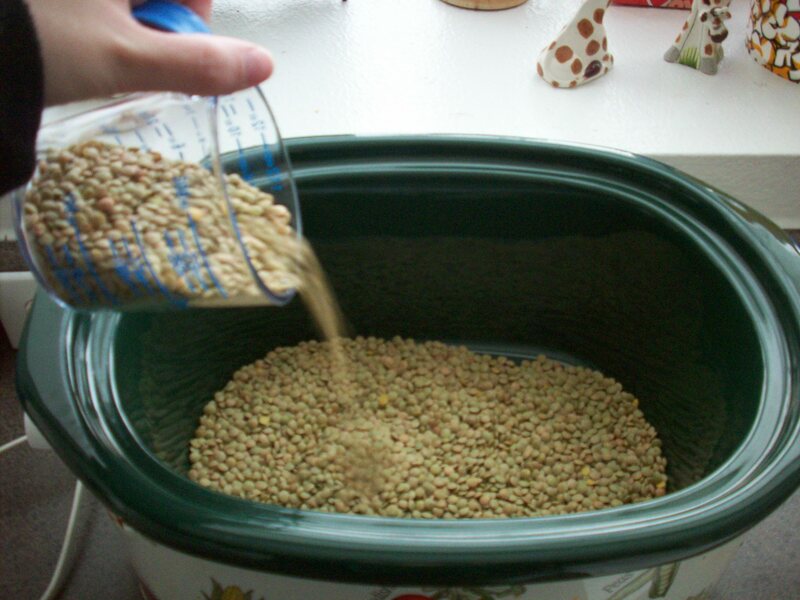 Just remember the 3:1 ratio of liquid to lentils. I also kept forgetting the Chorizo at the store and had to go back out a few times. The last time, those evil girl scouts were at the door with their cookies and their cute little faces asking you to buy cookies. I gave in. God bless Samoas. 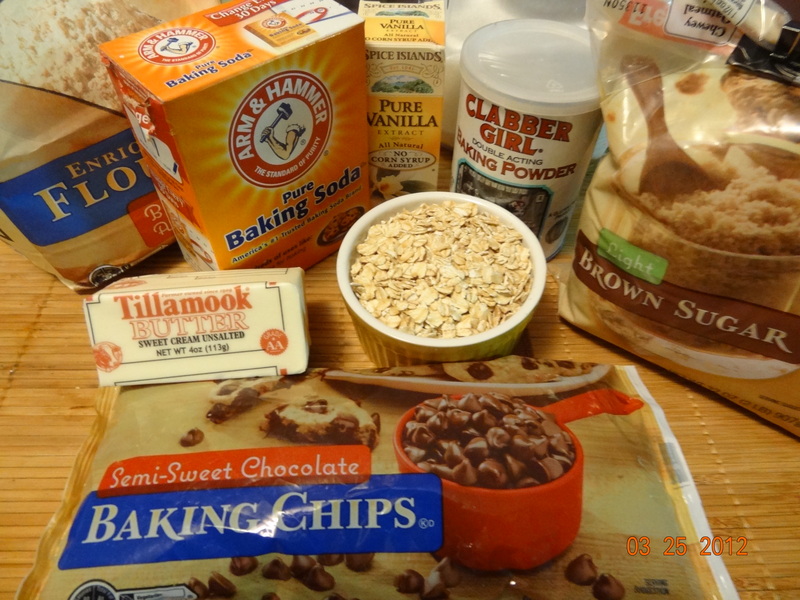 Hmmm… maybe i’ll try to make a homemade samoa. 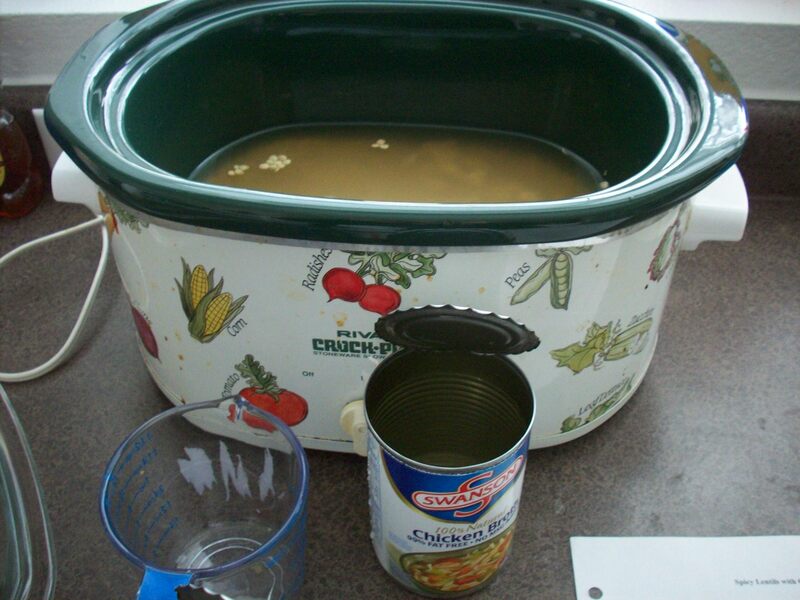 Add liquid, bay leaf and lentils to a crock pot on high. 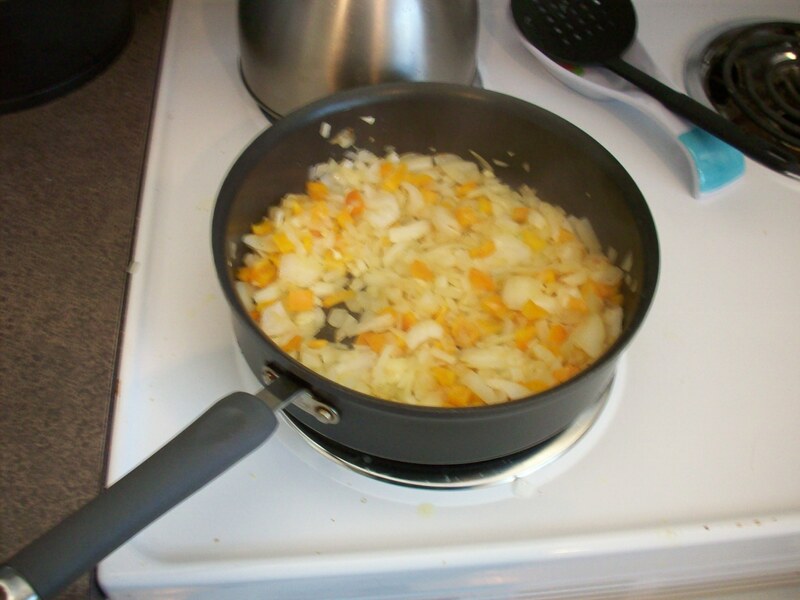 While those are going, saute up the onion, garlic and bell pepper with the olive oil. Dump it all into the lentils. 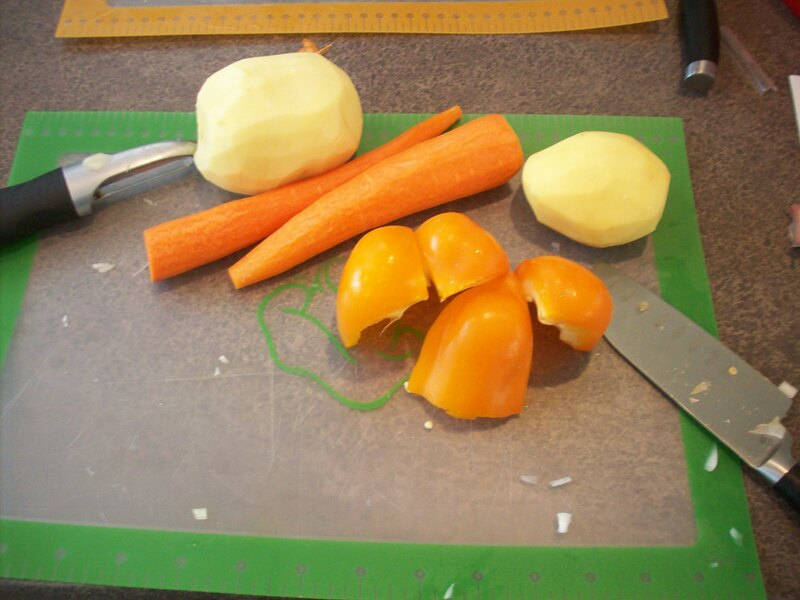 Add in the carrots and potatoes. Cover and let work on high for about 4 hours. 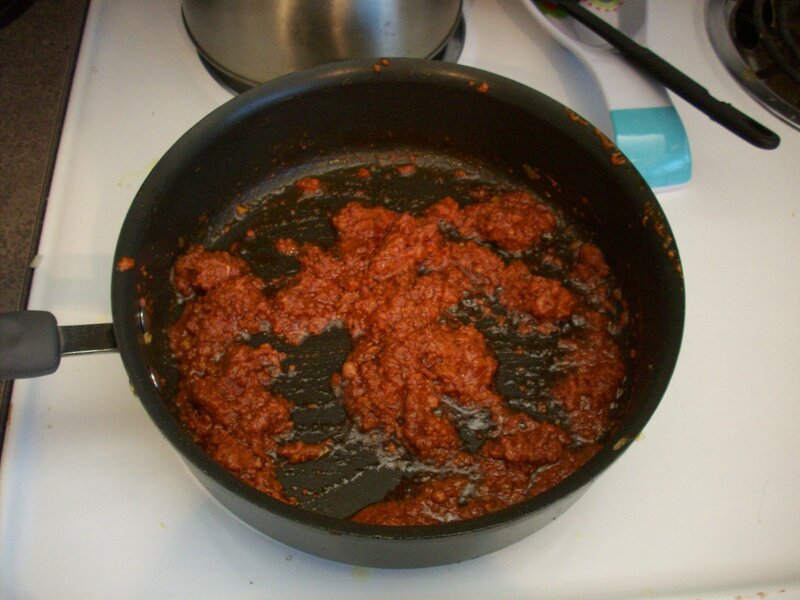 Put the chorizo into a pan and cook it through. Add the chorizo to the lentils and cook all the moisture has been absorbed by the lentils. 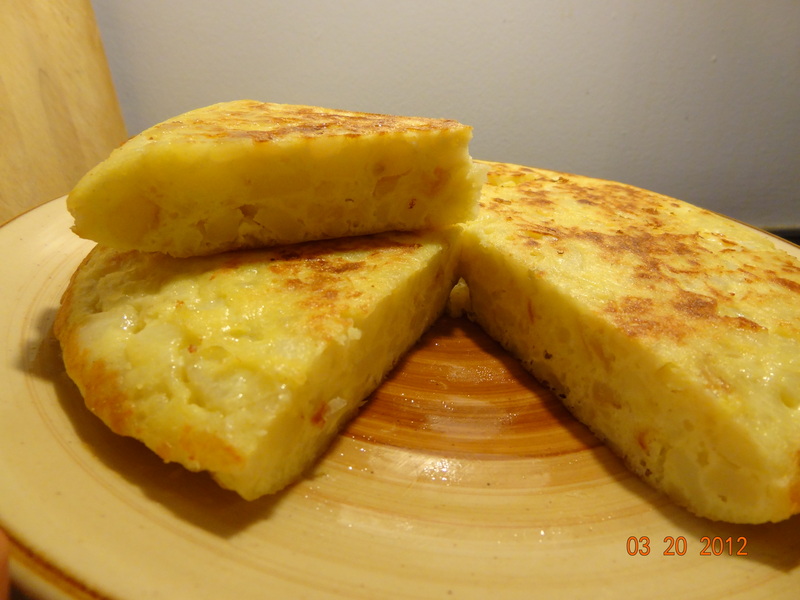 Tortilla de patata is a traditional tapa served in Spain either by itself, hot or cold or snugged between a piece of crusty bread rubbed with tomatoes, salt and olive oil (see pan tumaca). That’s right- I just busted out one of the few words I can say in Catalan, which happens to be my families native language. I can understand it and speak a word here or there, but I speak Castellano and not so much Catalan. Since I was a little girl, I can remember my favorite dinners with my mom: tortilla de patata, pan tumaca and some good green olives with a side salad. 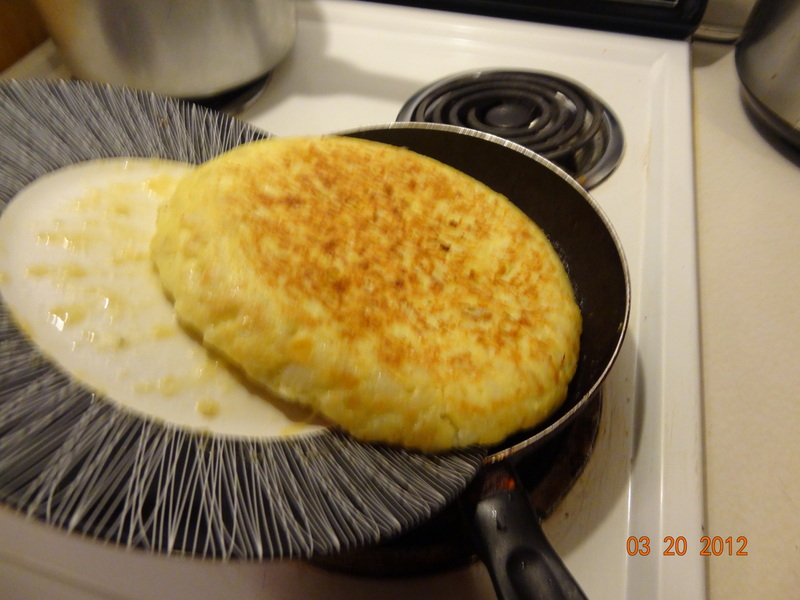 You may find one step of this recipe challenging, which is flipping the tortilla, but follow my fool-proof method and you can surely make this on your own. There are only 4 ingredients (and one is optional). Heat a skillet to frying temperature (350?). Something like that. 2. Fry your potatoes until they are nice golden, but not brown or crispy. 3. In the mean time, take your 5 eggs and put them in a medium bowl. Add the salt. 4. 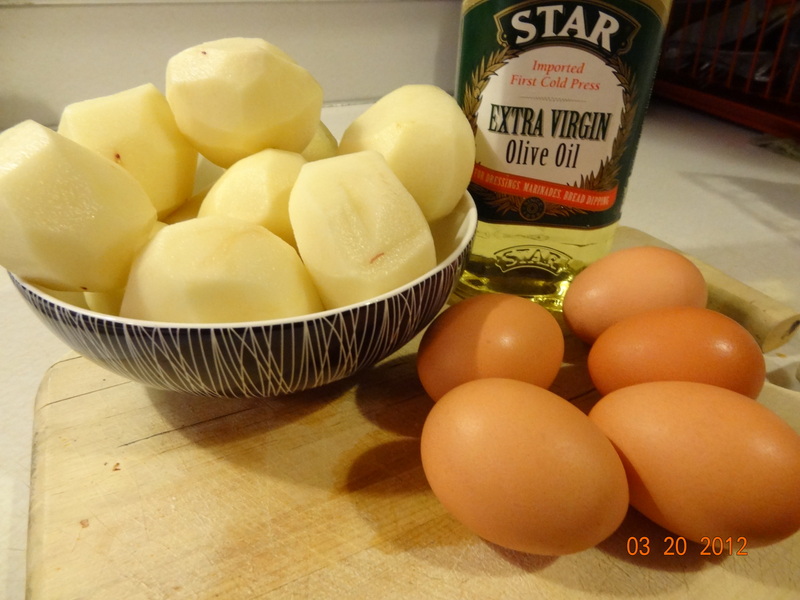 When the potatoes are golden and getting mushy, add them into the bowl of eggs. Scramble it all together until it looks like a yolky mush. Yum! Important: remove most of the oil from the pan leaving maybe 10% of what you used to fry or let me put it this way, just enough keep the pan lubed up. Graphic, I know. 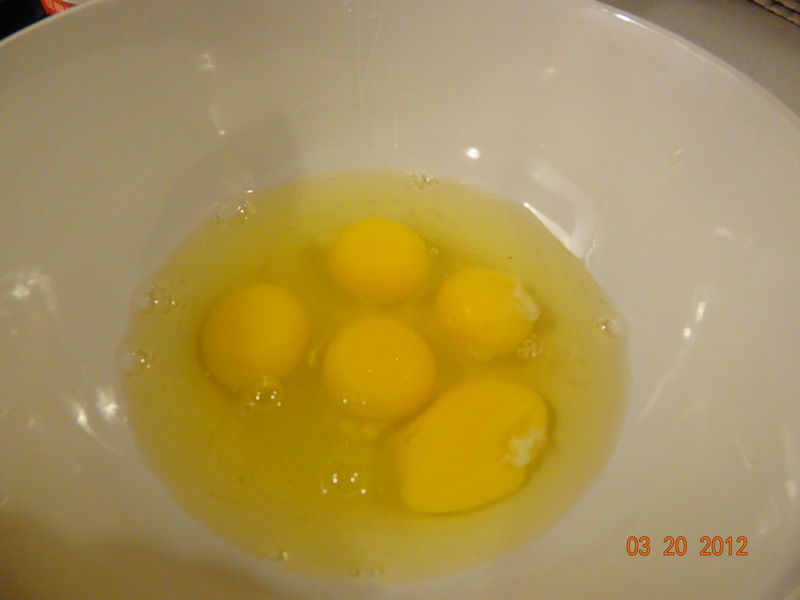 Then, dump the yolky mixture into the pan and lower the heat to medium. 5. Now here comes the tricky part. Because you’ve lowered the temperature enough, you’re NOT burning the bottom of the tortilla, RIGHT? Right. Take a spatula (a thin one) and peek underneath. Does it look golden and like it’s hardening? Good! Let it go at least 10 minutes so that the top also gets a little cooked and less runny. Then – it’s time to flip! 6. Take a plate that’s larger than your pan and cover your pan. 8. Now, remove the pan and put it back on the stove. 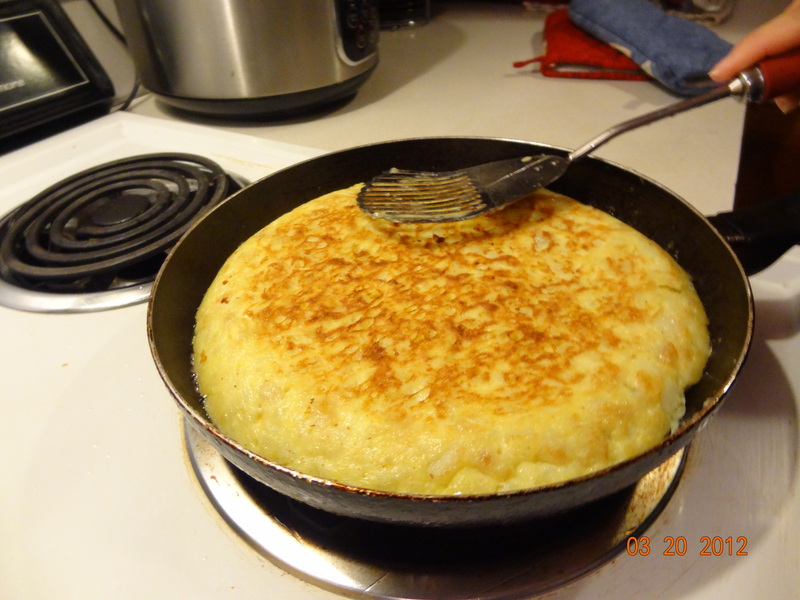 SLOWLY shovel the tortilla back into the pan pushing it little by little so half of it doesn’t end up outside the pan. 9. 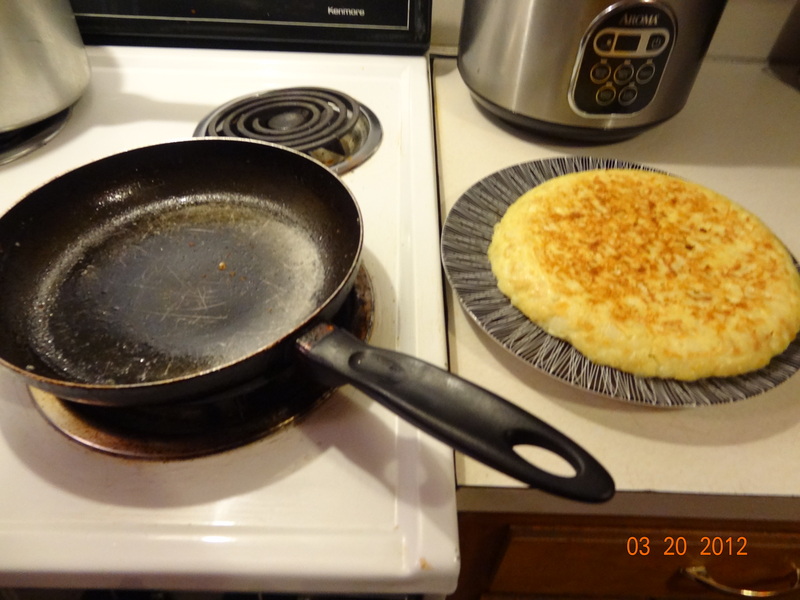 Push the edges down with your spatula so that the tortilla is nice and round and pretty. 10. After about 15 minutes of waiting and checking and making sure it’s not too hot, you’re ready to serve. Take a new, freshly cleaned plate (or wash the other one), and flip your tortilla again onto it’s serving platter (see method above). I love enchiladas. Especially the green sauce. Normally i’ll make the green sauce from scratch thanks to a fantastic recipe from my “extended family” in Arizona. But sometimes you’re just tired and it’s late and you’re cooking for your sister and everyone is hungry. So I use the stuff from the store. It’s good, but not as good as mine, which I’ll post at a later date. I wanted to cook my sister and her new family a yummy, healthy dinner because she is making my nephew grow into a big, strapping boy and he needs all the nutrients he can get from her. Plus, I know they’re hungry and tired of take-out all the time. This is also one of those times I sneak is as many veggies as possible. My sister referred to them as fajita enchiladas because I had some long strips of onion and green bell peppers that I sautéed up with my new favorite secret ingredient: Sazon. Make sure to put your sister to work, as the new mom is of course just full of energy and isn’t at all exhausted. Or mostly she’s starving and is trying to get the food on the table as fast as possible. 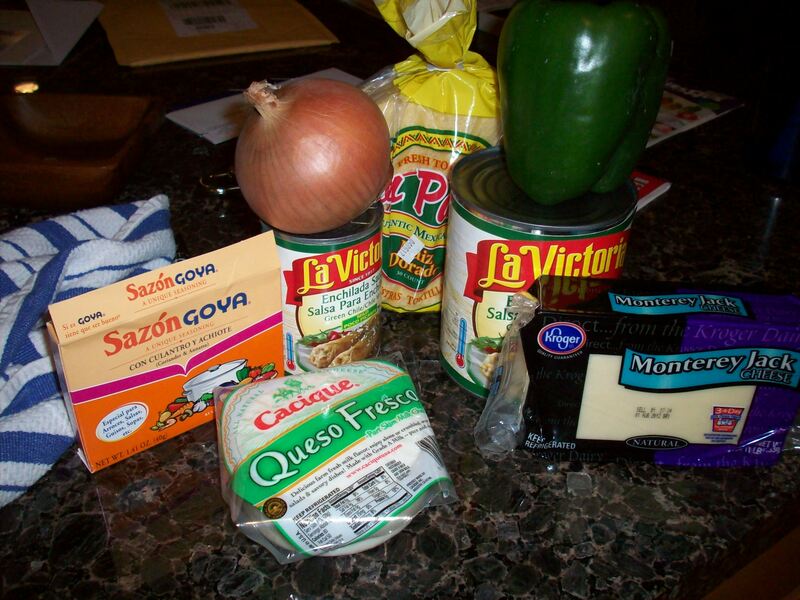 I used a combination of Monterey Jack and Queso Fresco this time, not Cotija. I used a different white cheese from Mexico that looked like it’d be interesting to try. Normally i’m a Cotija fan with my enchiladas. 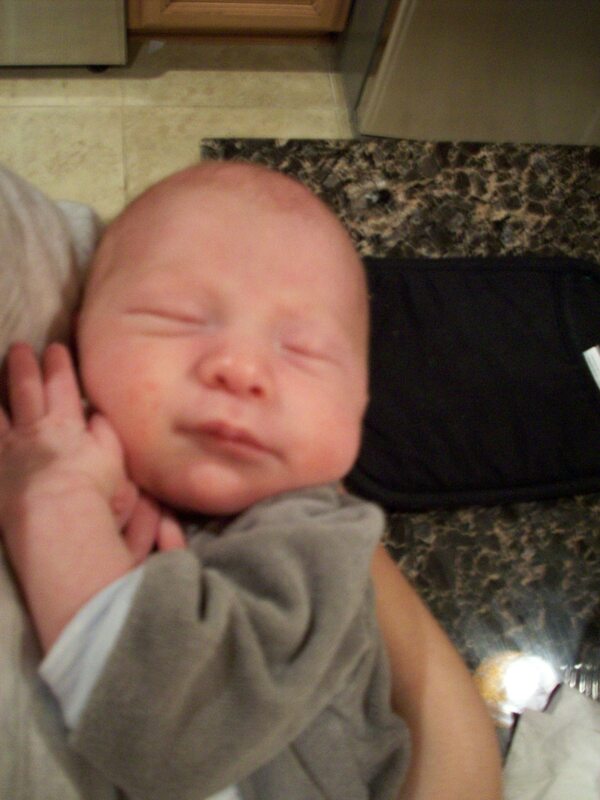 Isn’t my nephew perfect? I think he liked the enchiladas. 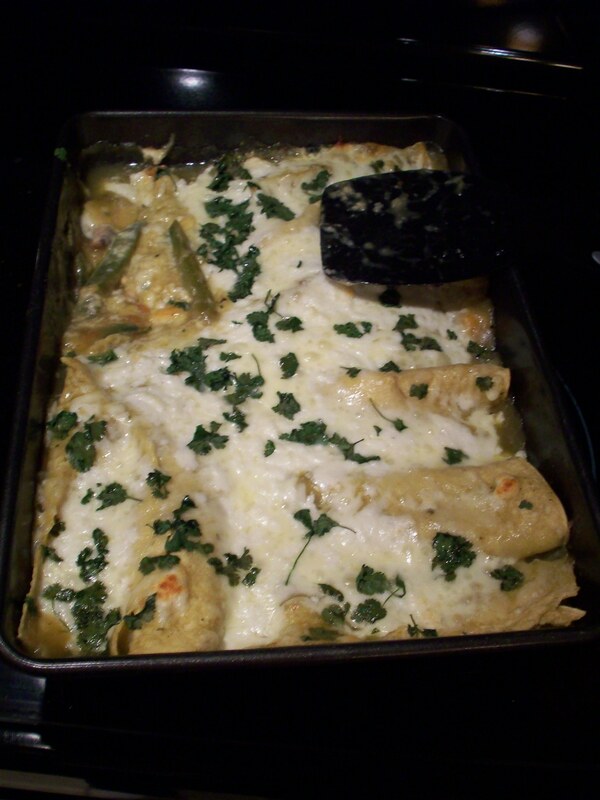 Start by preheating your oven to 350 and pour the small can of enchilada sauce in a 9×13 pan so the bottom is coated. Next, slice up the veggies and get them sautéing in some olive oil and sazon, with a little salt and pepper. Cook them to the firmness you like (I like them with a bit of crunch). Just before the veggies are where you’d like them, throw the chicken in and cook for a few more minutes. You don’t have to worry too much about the chicken being cooked through, as it will continue to cook in the oven. Remove from heat, and set up assembly line. You want to warm your tortillas first so they don’t break. I put 4 on top of the hot veggies and just use those. 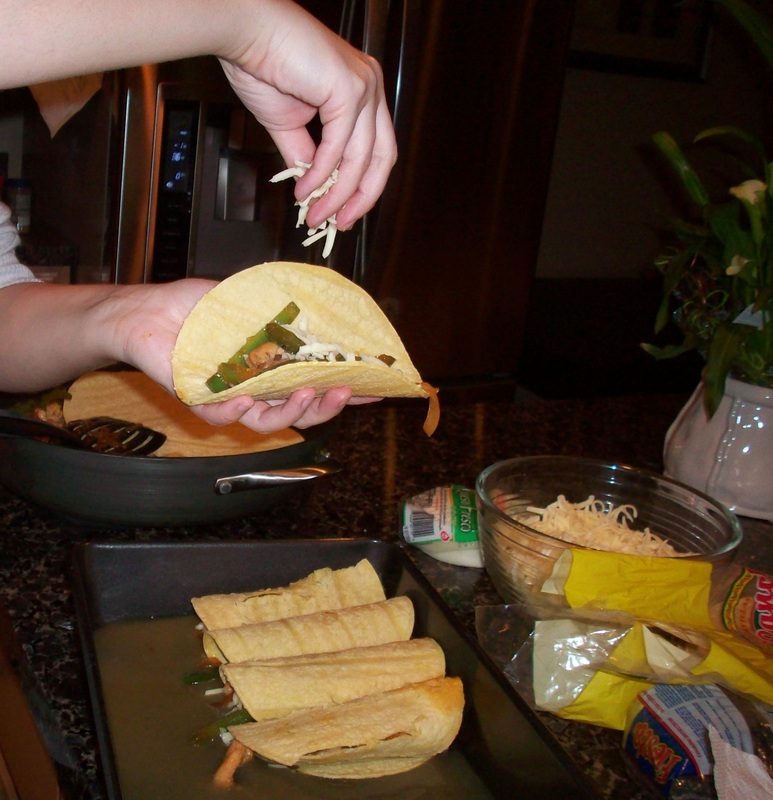 Spoon the chicken and veggie mixture into the tortilla, add some jack cheese, roll and place seam side down in the pan. Continue until the whole pan in full. You actually may have enough for a second plan. Pour the rest of the enchilada sauce over the top and then sprinkle with any remaining jack cheese, the cotija and the chopped cilantro. Bake for about 25 minutes, or until top is bubbling and golden brown. This was a first attempt at fudge the old-fashioned way. It was a birthday present for my friend Travis who helped me set this site up. Just a warning, the images ahead are graphic and will make you want to lick your computer screen. Do not do this. Mostly because it’s gross. 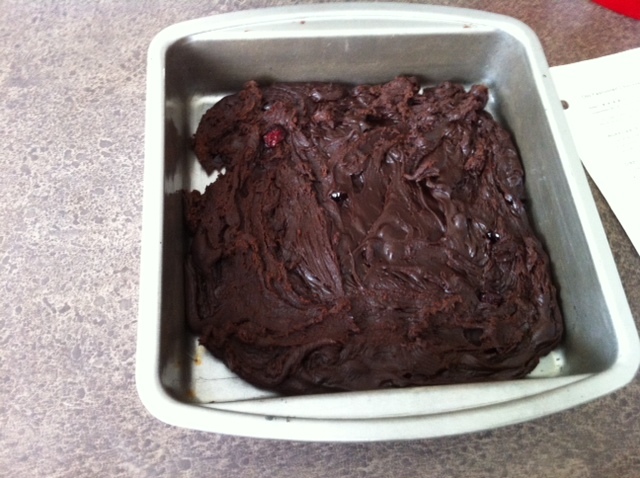 He is a big fan of fudge and cherries, so I put some dried cherries in the fudge. But you can feel free to add in whatever you’d like, such as nuts or other dried fruit. This is a recipe you need a candy thermometer for, and some patience. 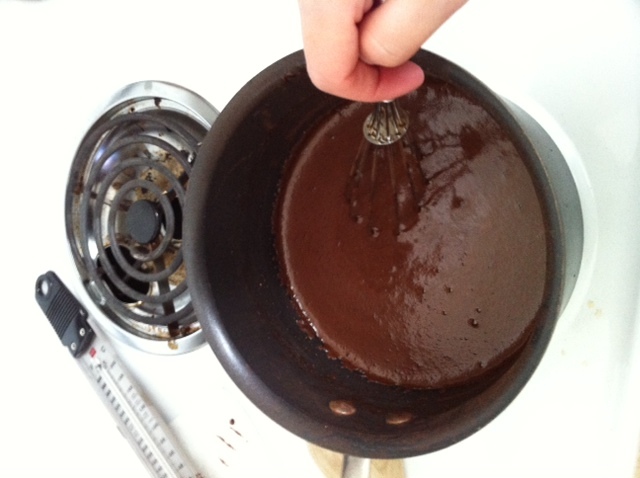 It also helps to have the best ingredients available, not using cheap cocoa powder. You also need a strong arm because the mixing is tiring. Although a tip I read was to let it cool to 115 before you mix. I will try that next time. But, it turns out awesome if you stick with it. I think I under-mixed a bit, so i’ll keep going even longer next time. Combine sugar, cocoa and milk in a medium saucepan. Stir to combine and keep stirring constantly until it reaches a boiling point. Once it boils, do not stir again. 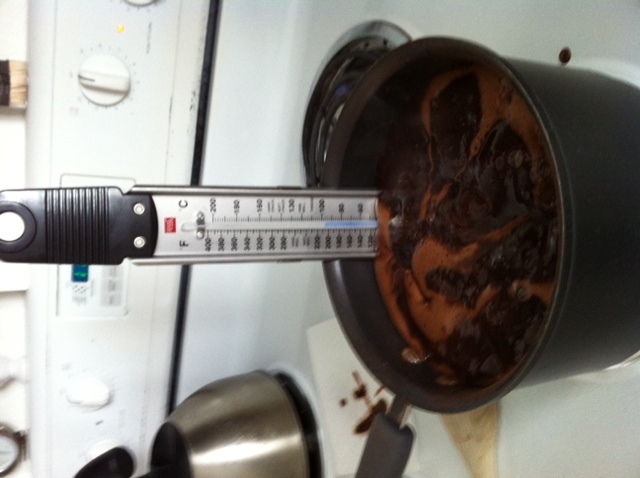 At this point, you want to put the candy thermometer in. Let it boil away until it reaches 238 degrees, or the soft ball stage. If you don’t have a candy thermometer, you know it’s soft ball when you drop a bit into a glass of cold water and it makes a nice, soft ball between your fingers. Remove from heat. Add in butter, vanilla and salt. Stir to combine. Add in any extras. This is where you stir, stir, stir until the fudge looses its sheen. Pour into a prepared pan and let cool. Cut into pieces and enjoy! I like spicy food, but seriously, I overdid it a little bit here. 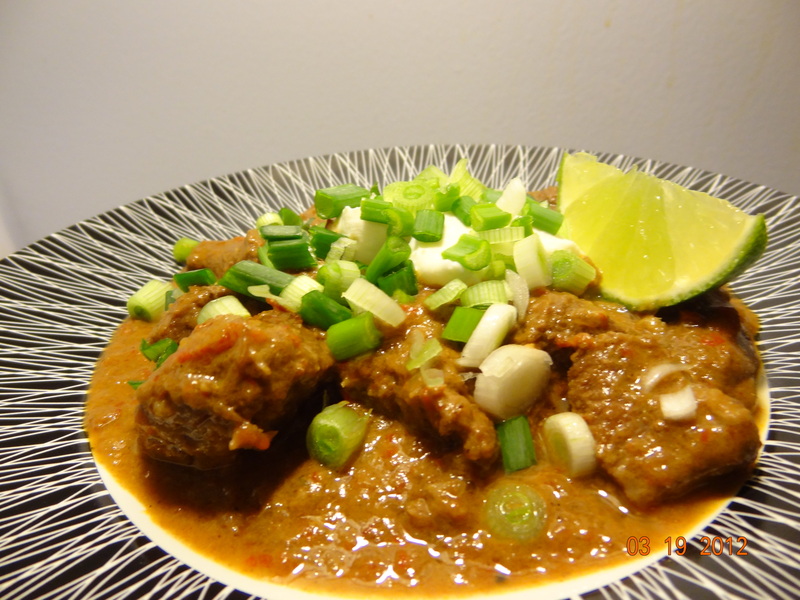 So, if you really, really, REALLY enjoy spicy food, you will absolutely love this dish. 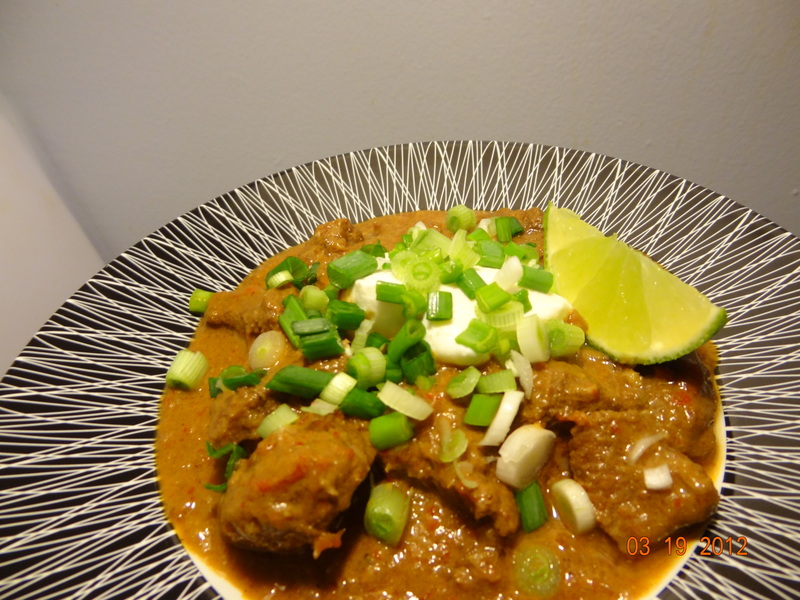 It is a spicy version of Cuban Ropa Vieja (yum!). 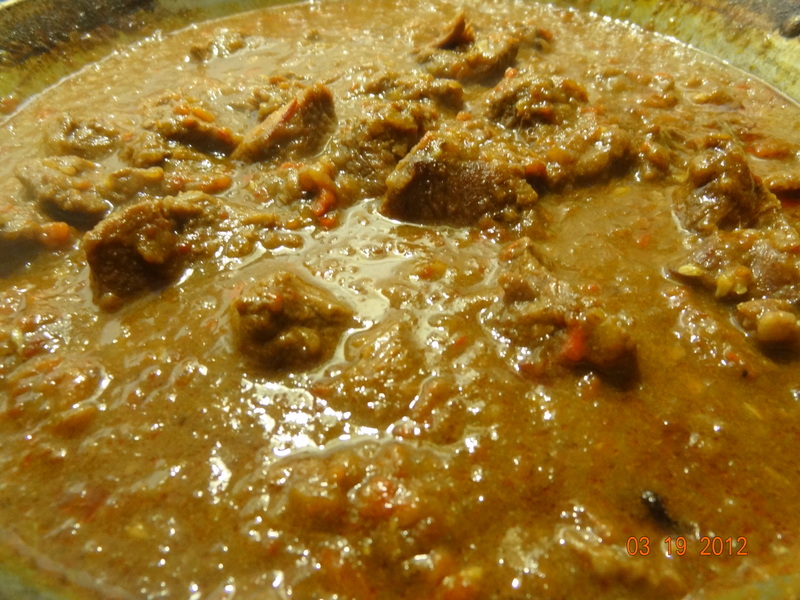 The beef is completely fork tender and just falls apart, the sauce is thick and full of flavor, and spice level is to any lunatic’s desire (eta by Rebecca: Holy Moly! Spicy!). To improve this dish, I would certainly use about half of the Chipotles. It would make it a tolerable level of spice! The flavor is here, so play with the spice level and I’m sure you’ll enjoy. 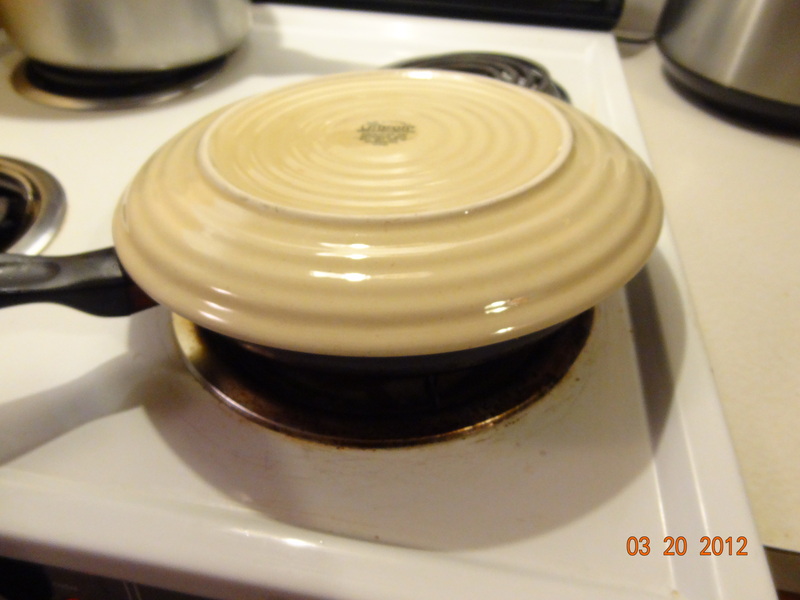 I happened to use my pressure cooker, but if you don’t have one, use a cast-iron pot or dutch oven. 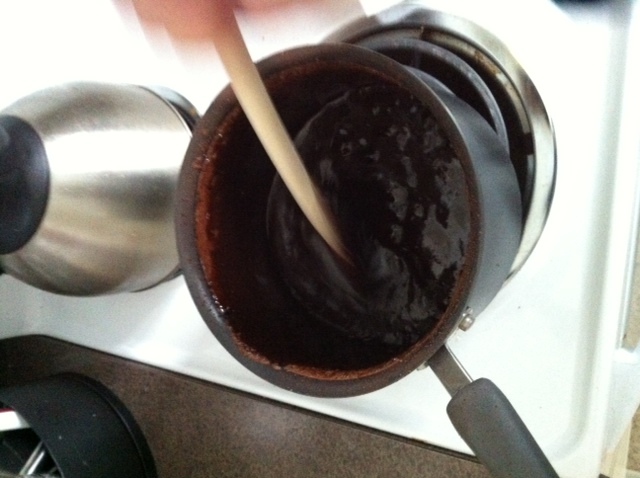 First, turn the heat to brown and pour in a teaspoon of olive oil (or less than one time around the pot). Dump in the onions and red bell pepper. 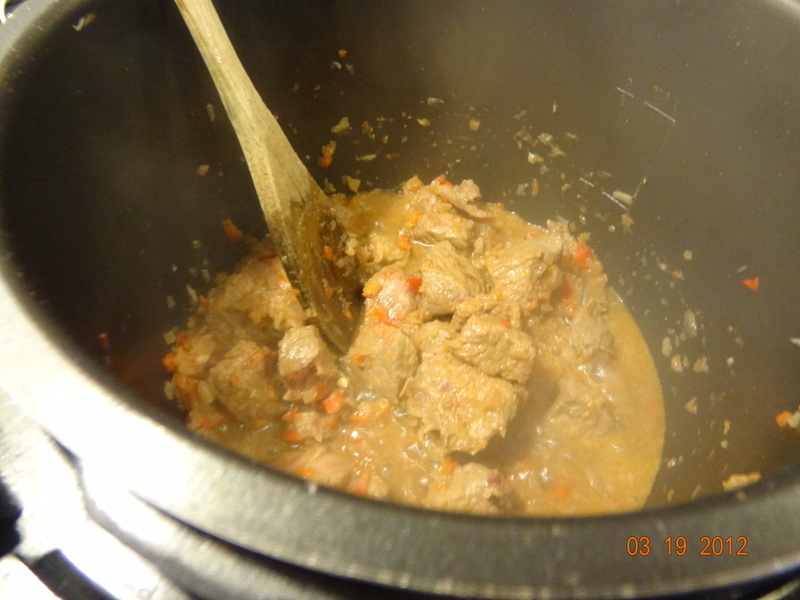 Let the onions and red bell pepper soften for 3 minutes, then add the beef. Season with salt and pepper. Mix. 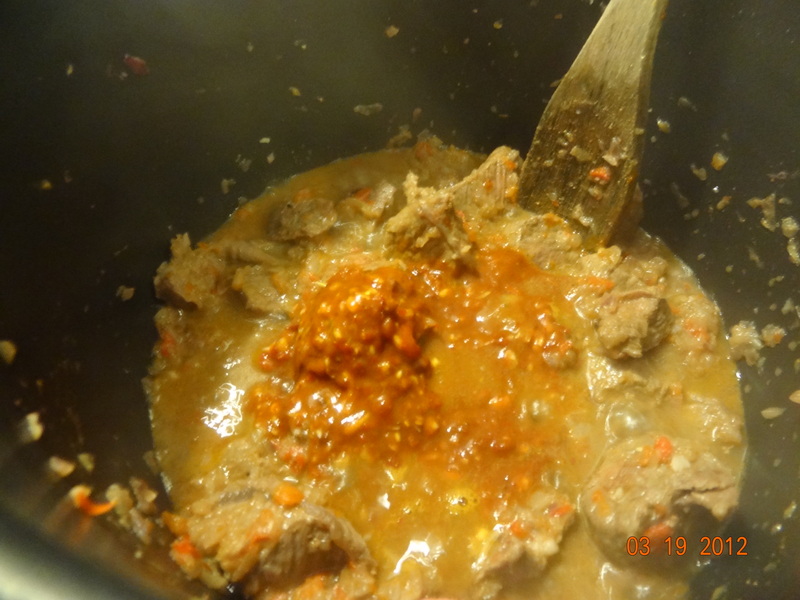 In a mini food processor, combine 1-3 chipotles from the can, 5 cloves of garlic and 1/4 cup of your beef broth to liquify it all into a sauce. Pour it into the pot. 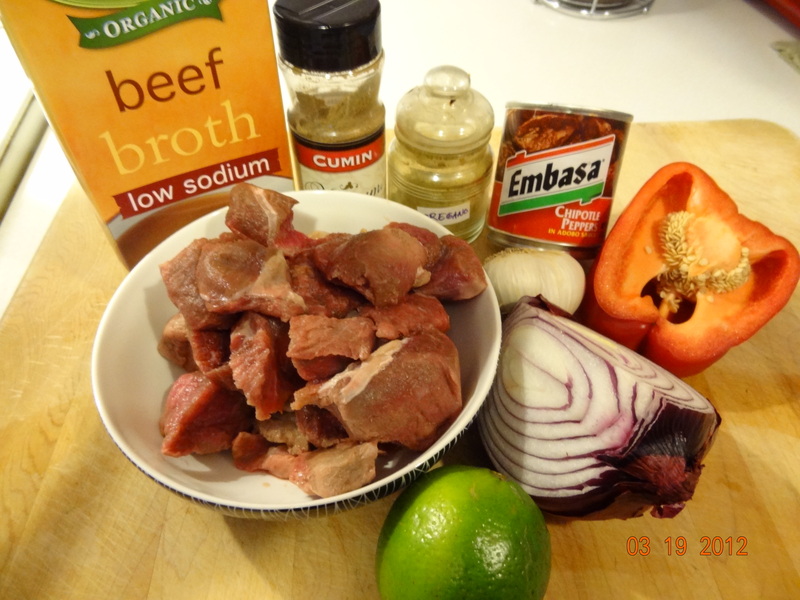 Next, pour in all of the beef broth and squeeze the juice of the lime in the pot. Add the cumin and oregano. Stir well. At this point, it should look soupy. If you have one, turn your pressure cooker on HIGH for 20 minutes. 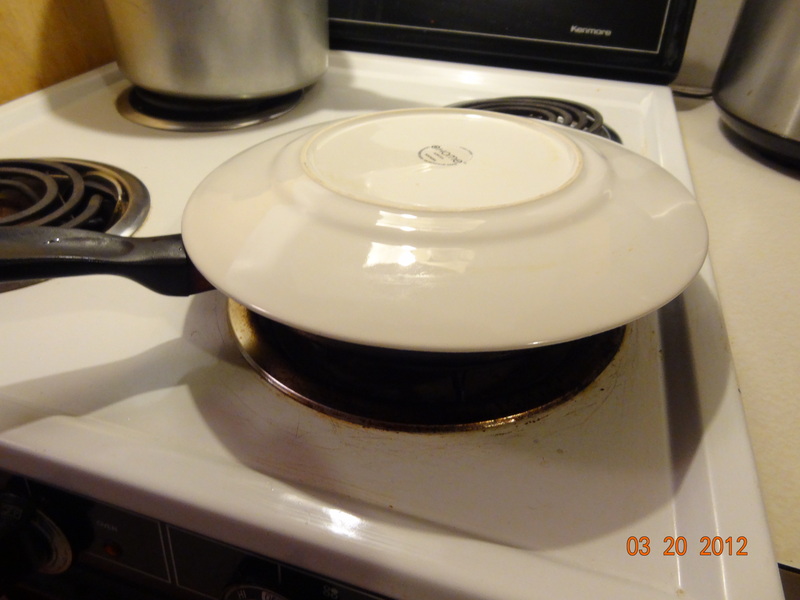 If you don’t have a pressure cooker, cover with a lid and turn the heat to medium for 40 minutes (carefully watching). 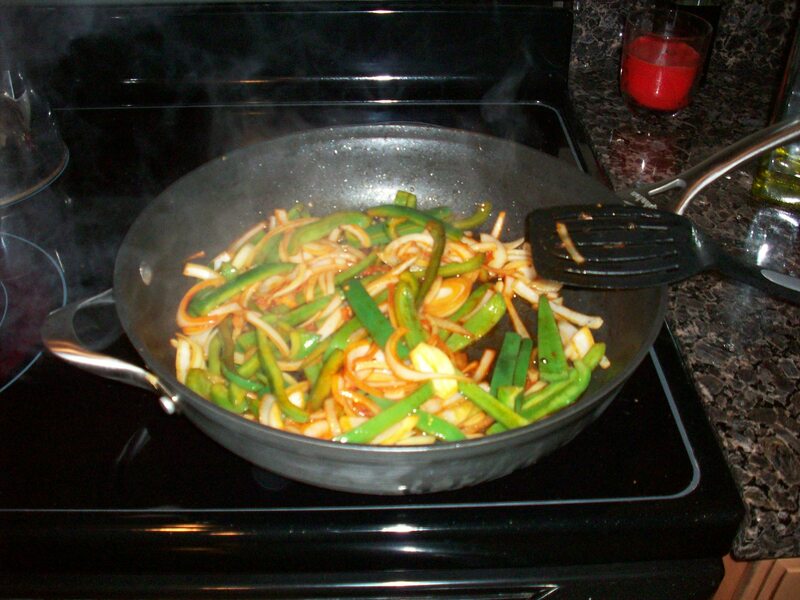 Scrape the bottom of the pan and pick up all of the yummy goodness that sticks. 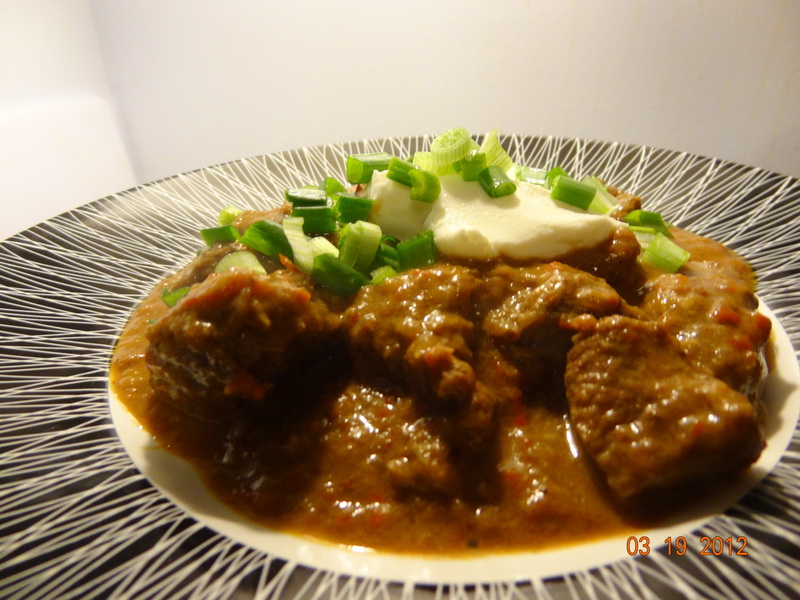 I dished this up with a dollop of sour cream and fresh, cold green onions and wedge of lime. See below. Ok, I know. Who am I to tell you how to mash your potatoes? I mean, everyone has their own way of doing it and that way is usually the best. Here’s a secret for you though. Come closer. 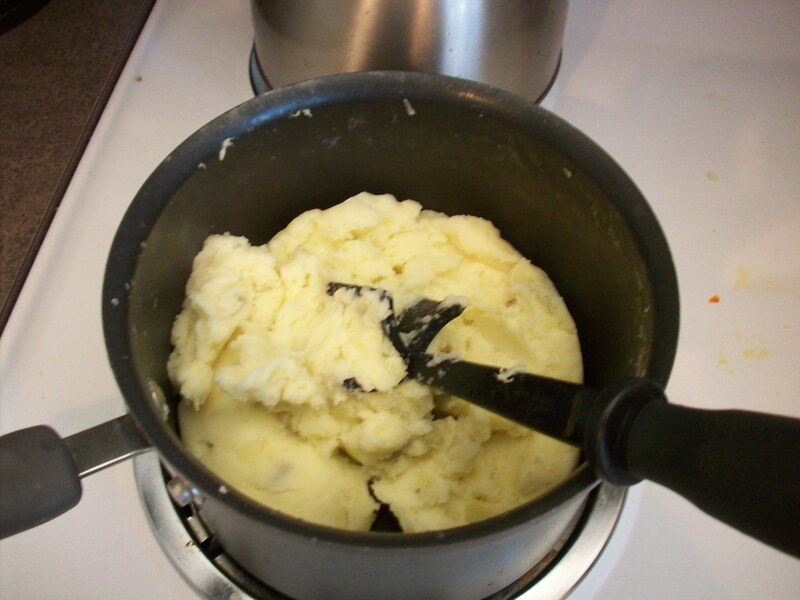 There are actually people out there who don’t know how to make mashed potatoes. I know, right?!? What are they doing? Well, some prefer the ease of using a *gasp* box. Powdered potatoes. With water added. It hurts my soul a little. There are also people, like my lovely roommate, who have no idea how to cook at all. Which is part of why i’m doing this blog. To show people how easy it is to make healthy, fun, yummy recipes at home with ease! There are so many ways to play with mashed potatoes. You can use any type of potato you want, I used yellow ones here because they looked yummy. With red potatoes you can even leave the skin on, like Cheesecake Factory. Mmmm… Cheesecake. You can also add in all sorts of ingredient. Have sour cream on hand? Throw it in? Chives? Yum! Instead of milk, use chicken broth to keep it lower in calories (although frankly for how little calories and fat it adds, compared to the flavor, i have never been a big fan). But hey, to each their own. 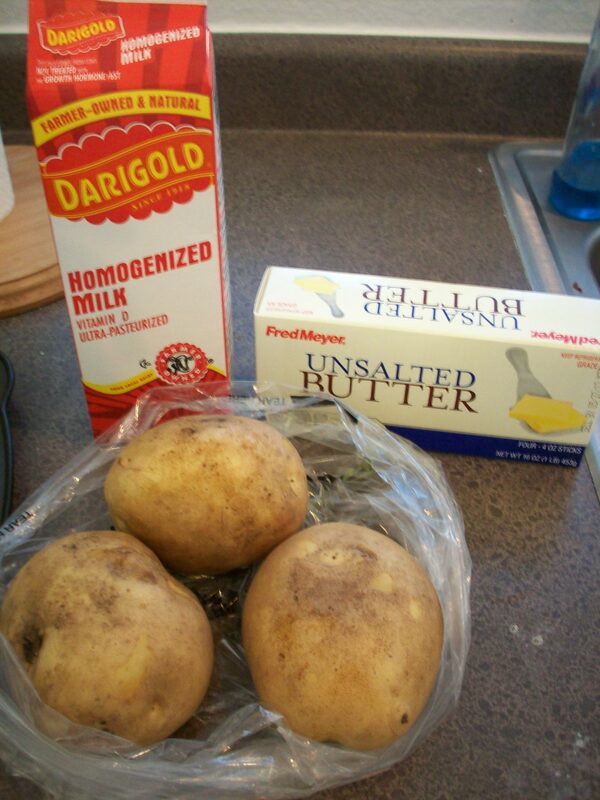 All that’s required is potatoes, water to boil them in, something to mash them with, and some add-ins. That simple. 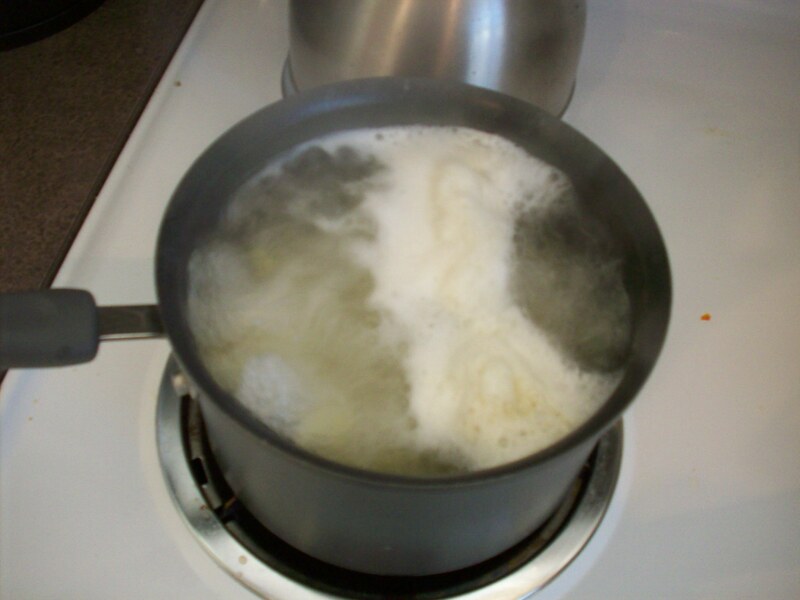 Put a pot of water on to boil. There should be enough water that you’re sure all the potatoes will be covered. 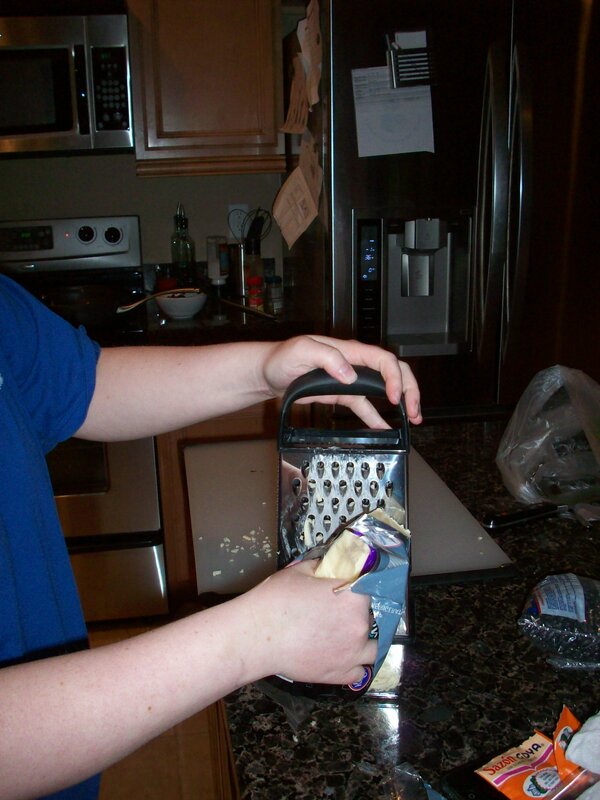 Peel the potatoes, then chop into equal sized chunks. About 1-2 inches is best for a quicker cooking time. 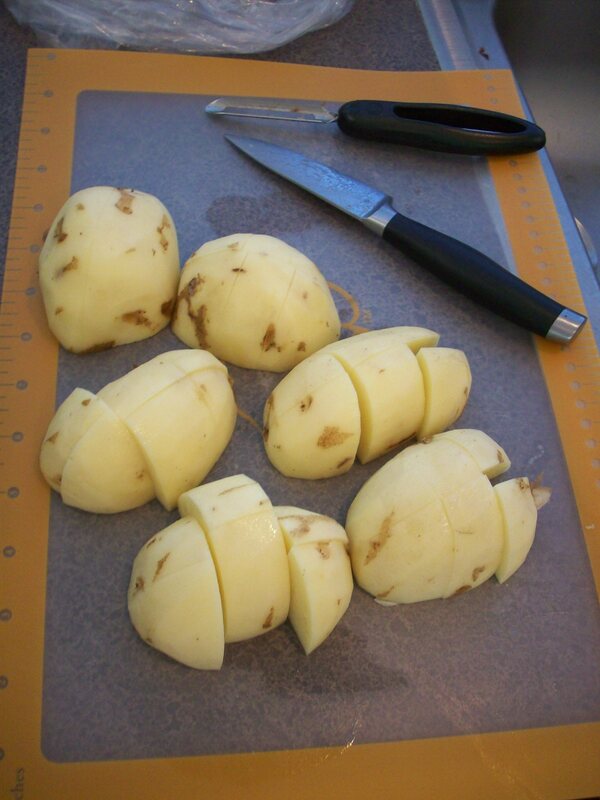 Boil the potatoes until they are fork tender. Easily stabbed and will break apart if you try to cut it with the fork. Turn off the heat, drain the potatoes and put them right back in the pot back on the stove. 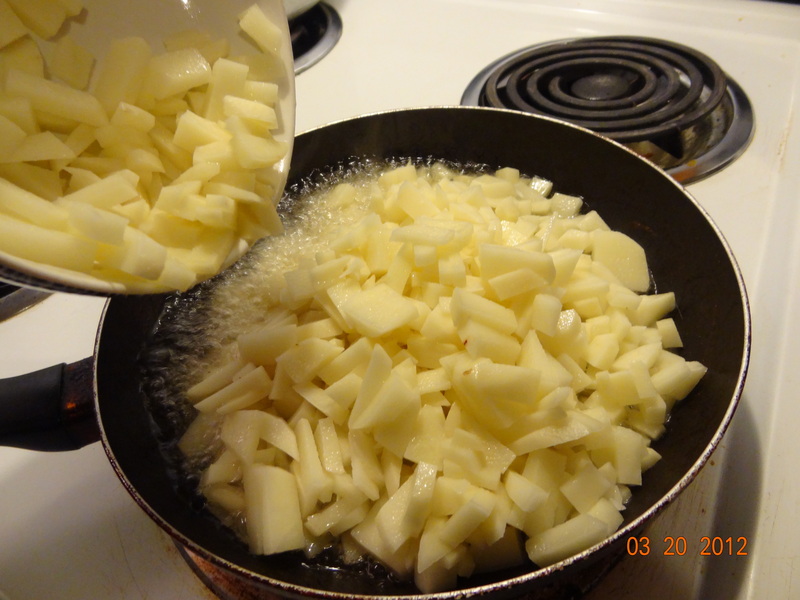 The residual heat will help dry your potatoes and melt the butter. Add in the butter and mash until it’s all gone. Little by little, add in the milk. Be really careful, because you can always add but you can never subtract. Keep mashing and mixing until you have your desired creaminess. If you have extra mix-ins, like sour cream and stuff, hold off an a little of the milk as the sour cream will make it creamier. Add in your salt and pepper to taste. Enjoy! 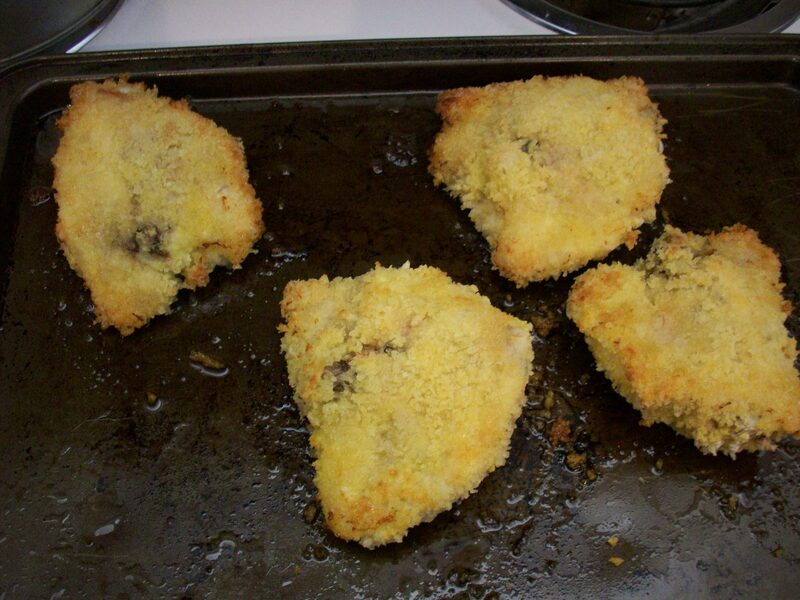 Oven fried chicken is an easy way to get your fried chicken fix without all that grease. To top it off, the grease you do get is from healthy olive oil, rather than a less heart healthy alternative. I, personally, am a huge fan of panko breadcrumbs. They provide a lot more of that satisfying crunch than regular breadcrumbs. However, you can feel free to use whatever you want to coat it. Only have cornflakes? Have at it! Make it with a cornmeal/flour mixture. Experiment; it’s what I advocate. I also say play with spices in your breadcrumbs. Throw in some paprika for smoky flavor, chili powder for some kick, or whatever taste sounds good. I love rosemary with my chicken, but I didn’t have any fresh. 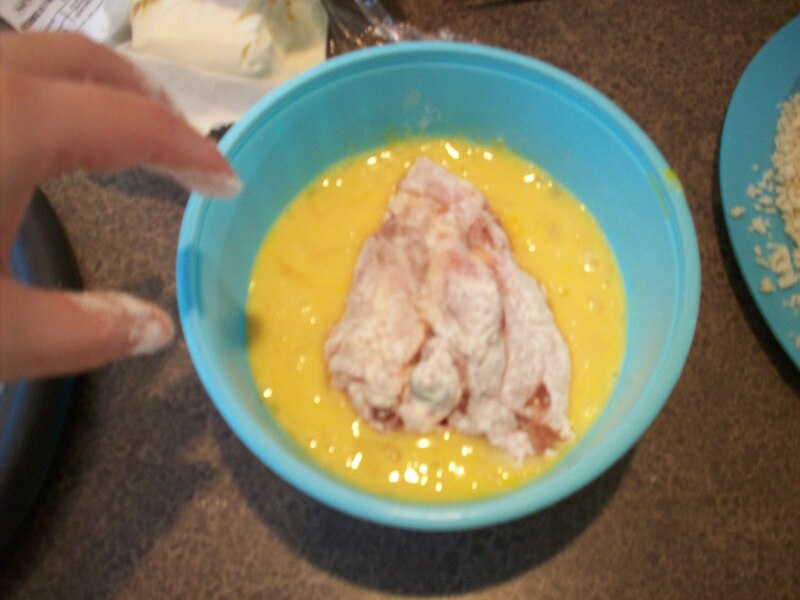 To make the chicken, you first dredge it in flour (seasoned with a little salt and pepper), then dip it into your egg mixture (which has some hot sauce, ’cause that’s how I roll), then into the breadcrumbs, which are also salt and peppered. Also, when breading, make sure to have everything lined up and ready as you will get super messy. This would actually be a fun task to give a kid who is old enough to know about raw chicken and washing hands. Because you will otherwise want to fry your hands along with the chicken. But don’t. That would not be advisable. Get your assembly line all ready before touching the chicken. Set out a plate with the flour on it. Add in some salt and pepper. 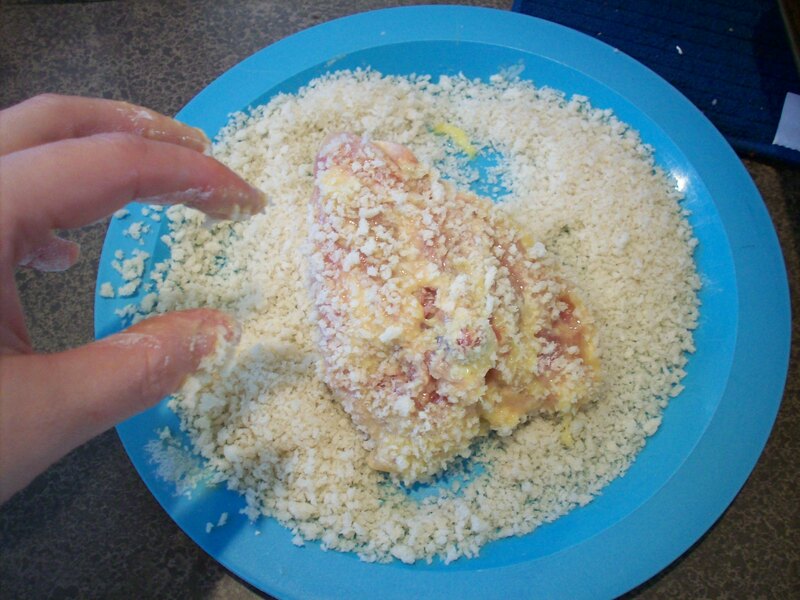 Set out another plate with your breadcrumbs, any additional seasoning and more salt and pepper. Finally, get a cookie sheet and get a nice layer of olive oil going on it. Put it at the end of the line, this is where you’ll place your chicken. I took off the skin of the thighs, but left the bone in. You can do your chicken however you want. 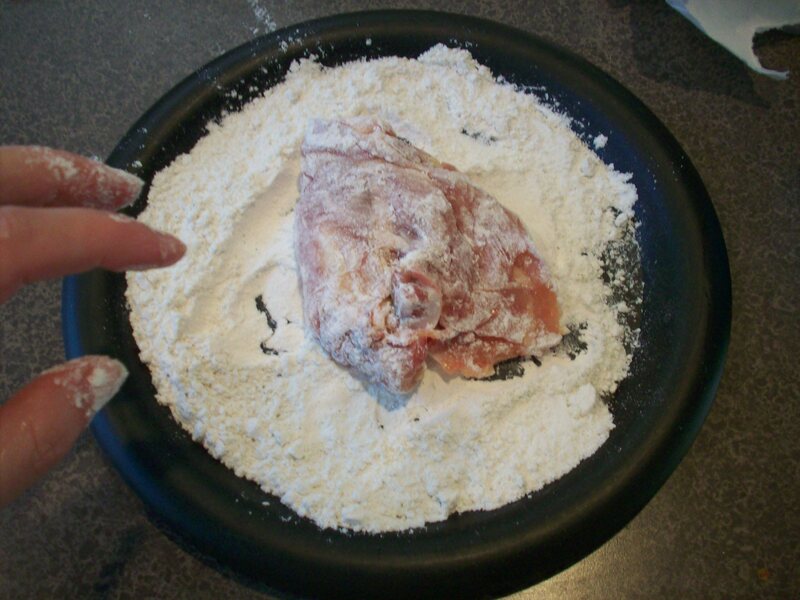 Take the chicken and do a light coating of flour. Throw it into the egg mixture. Quickly put it in the breadcrumbs, and get all sides of it. This is the only layer you want to be thick. The others should just be quick, slight layers. Put your chicken on the cookie sheet. Start on thigh 2, no stopping, no touching anything. 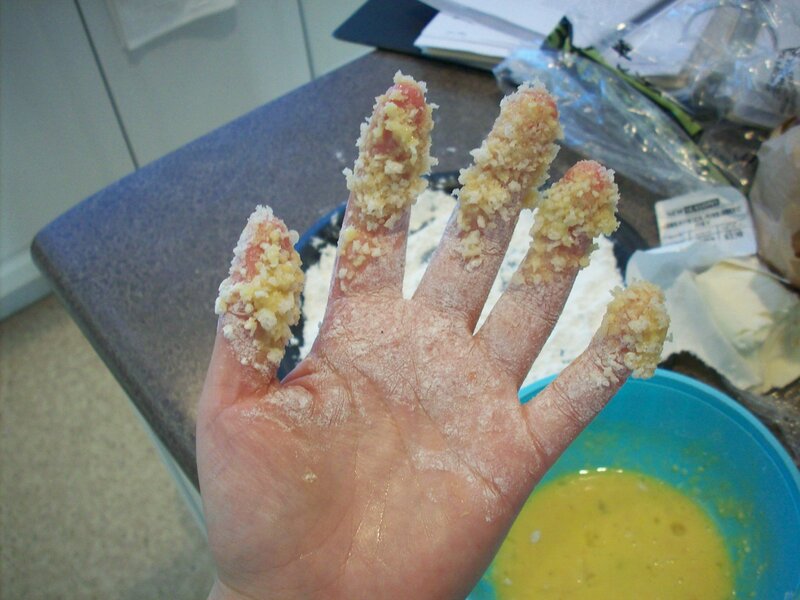 Once you’re finished dredging and your hands are clean, put the chicken in the oven for 40-50 minutes, flipping them halfway through. Chicken Tikka Masala has a long and complicated history that has undefined origins and vague specifications for “traditional recipe.” You know what? If you really want to read about it click here. Unfortunately for Weight Watchers members, Indian food isn’t the healthiest thing that ever roamed the planet, so generally, I avoid it. 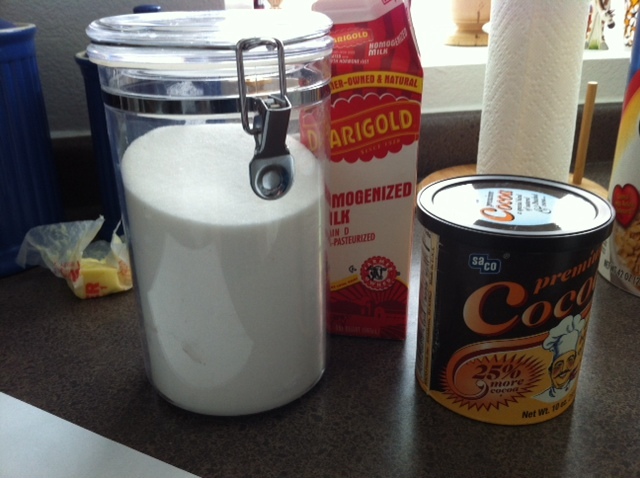 Until…I discovered Coconut Creamer by So Delicious. So Delicious is a brand of all natural, dairy free coconut milk based out of Eugene, OR. Woo-hoo! LOCAL- I love it. Did you know So Delicious Coconut Cream is an amazing substitute for heavy cream in any and all recipes? It doesn’t taste much like coconut (at all), but provides the same creamy texture. As an added bonus, So Delicious Coconut Cream has no fat and only one carbohydrate per serving. In a 1/4 cup (as in, the amount of milk you’d put in your morning Cafe con Leche), there are ZERO points. That’s right, morning coffee is ZERO points. Double woo-hoo! Right, chicken tikka. 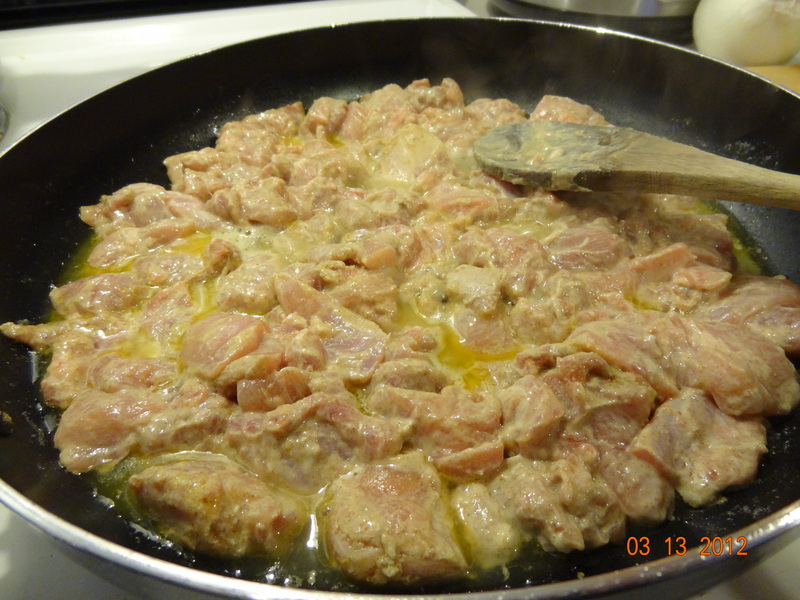 Cut the boneless, skinless chicken thighs into 1- 1 1/2 inch pieces. Sprinkle the coriander, cumin and salt over the chicken, then stir in the yogurt until all the pieces are evenly coated. Cover lightly and let sit for 20 minutes before proceeding (overnight if you can). Prepare the sauce. Return the pan to the heat and melt the other half of the butter over medium high heat. 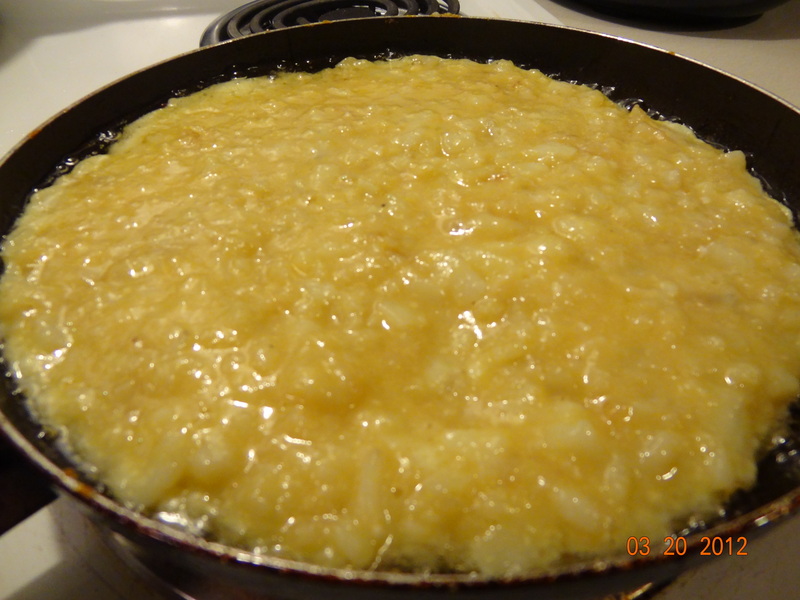 Add the onions, garlic, and kosher salt, then stir. 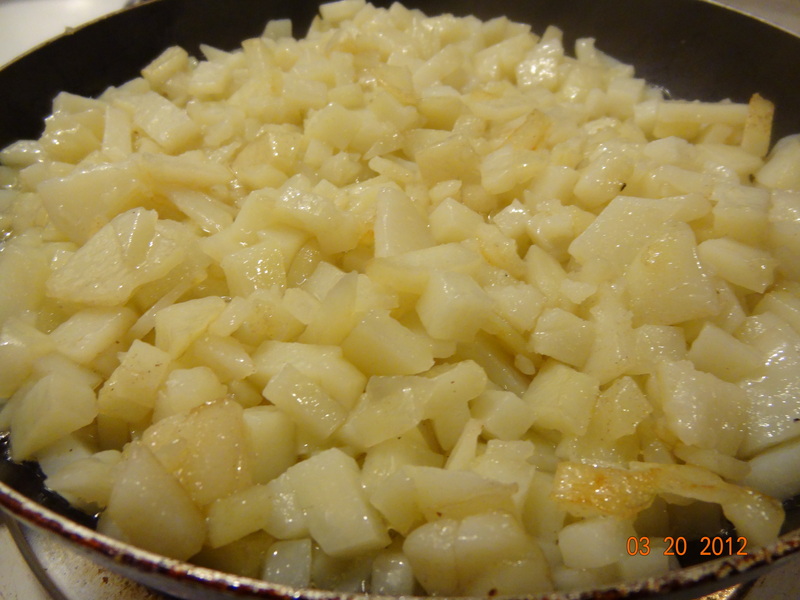 Cook, stirring frequently, until the onions begin to lightly brown around the edges. Stir in the garam masala and ginger and cook until fragrant (about 1 minute) before raising the heat to high and adding the crushed tomatoes. Stir well, scraping the caramelized bits from the bottom of the pan, and bring to a boil. Pour over the chicken in the slow-cooker. Cover and cook on HIGH for 2 hours, or until the chicken is very tender. Use a fork or whisk to stir the cornstarch into the coconut cream until smooth. 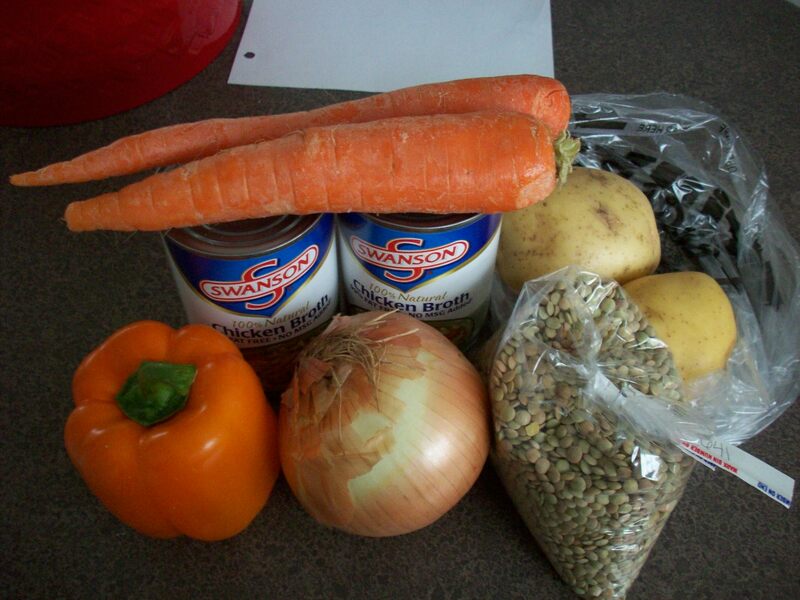 Pour into the slow-cooker and stir gently until the colour is even. Replace the lid and let cook for 2 more hours or until bubbly around the edges. 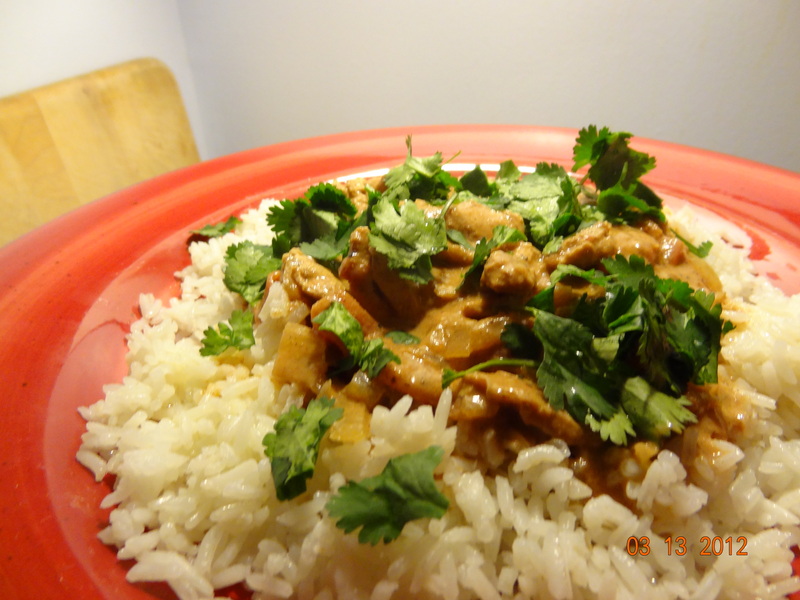 When you’re ready to serve, heat up some brown or white rice. Chop your cilantro and garnish with the fresh cilantro. Enjoy! I used to love biscuits. And bread. And anything baked. And then a little over three years ago I was diagnosed with Celiac disease. Celiac disease is an auto-immune disorder in which the body’s immune system is triggered by the gluten protein (more specifically, a prolamine of the gluten protein called gliadin) found in wheat, barley, rye, and sometimes oats. At that point I didn’t know anything about alternative flours or how the heck I was going to give up my beloved bread. I didn’t even know much about cooking, let alone baking. So I starved for awhile. And then I got tired of being hungry and started researching, experimenting, and testing. When most people think about gluten-free cooking they think of rice flour, sorghum, teff, amaranth, etc. Most folks don’t think about nut flours. 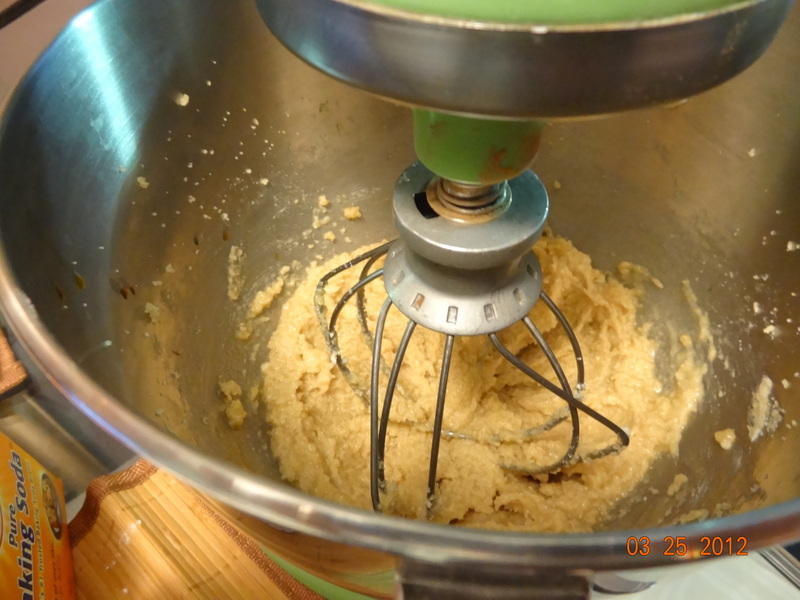 Poor almond flour is the red-headed stepchild of the gluten-free world. 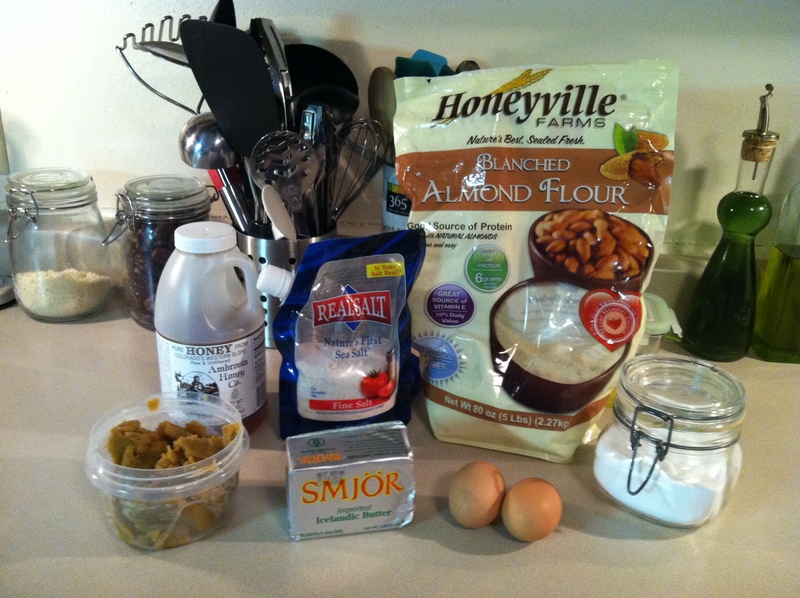 I love baking with almond flour, as it’s high in protein and gluten- and grain-free. Plus, it’s so much easier to use a single ingredient than trying to whip up a gluten-free baking mix from four different grain flours and various binding agents! My hubby has dutifully gone gluten-free and grain-free for me (at least in our home), but I know he misses his bread with dinner. And so do I for that matter, even three years later. I came up with this biscuit recipe a couple of months ago as a way to have an on-the-go snack I could take with me when running errands on the weekends, and luckily my husband loves it! I make a batch almost every week, but they never last more than a few days. So here you go–a gluten-free, grain-free, protein-rich biscuit that will fill you up and satisfy your carb cravings. And the butternut squash adds a hint of sweetness and a dose of good nutrients as well, including Vitamin E, Thiamin, Niacin, Vitamin B6, Folate, Calcium and Magnesium, and a very good source of Vitamin A, Vitamin C, Potassium and Manganese. Heat oven to 350 degrees. 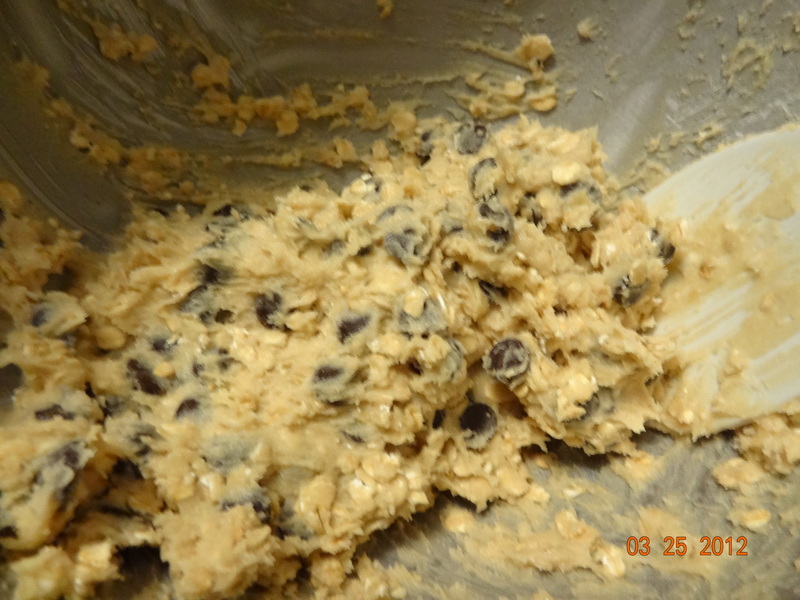 Mix all ingredients together in a medium bowl with a hand mixer until well combined. The batter will be very thick (see picture below). Using an ice cream scoop (about 1/3 cup), drop batter onto a parchment-lined baking sheet leaving an inch between each biscuit. These biscuits will not spread while baking, so there’s no need to leave more room. 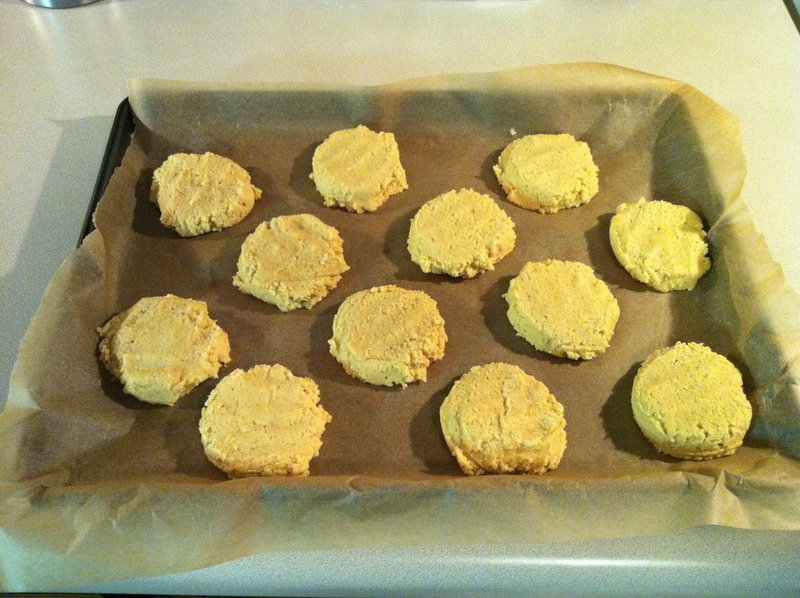 Using wet fingers, flatten each biscuit slightly. 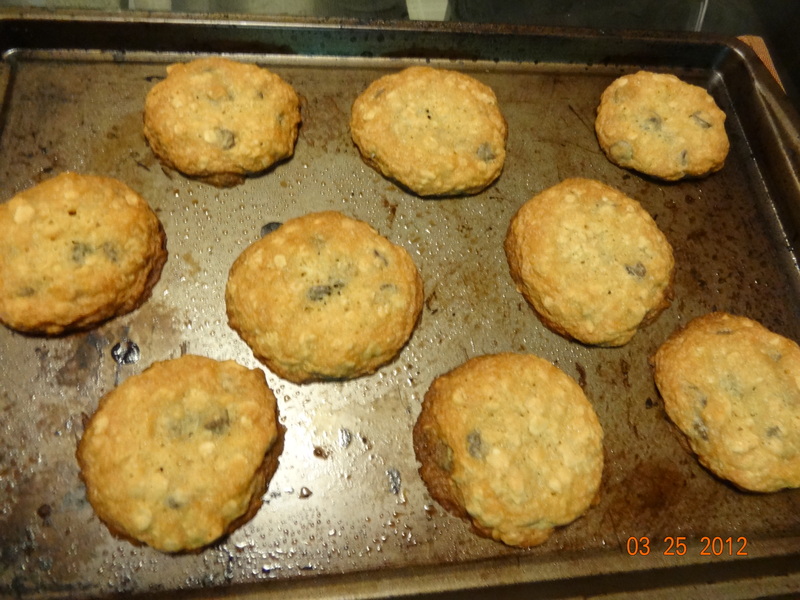 Bake for approximately 20-22 minutes, until tops are golden brown and cracks have formed. Note that almond flour browns more quickly than traditional flours (as do baked goods containing honey), so make sure to check that biscuits are done by checking for firmness and not by color alone. Let cool for five minutes on pan, then remove to a cooling rack (or dinner table!). Recipe makes 12 biscuits. These are best fresh out of the oven, but will last several days stored in an air-tight container outside of the fridge. Slice one open and toast it up in a toaster oven (if not fresh out of the oven), then top with a dollop of pastured butter (from grass-fed cows) for a lovely dose of Vitamins A, D, and K2. Not to mention amazing buttery flavor.